In July 1916, all Regimental Machine Gun Sections were to be excised and brigaded to form a Machine Gun Squadron. The 5th, 6th and 7th Machine Gun Sections were combined to form the 2nd Machine Gun Squadron under the command of the Brigade. In July 1916, all Regimental Machine Gun Sections were to be excised from the regiments of the 2nd Light Horse Brigade and brigaded to form a Machine Gun Squadron. The 5th, 6th and 7th Machine Gun Sections were combined to form the 2nd Light Horse Machine Gun Squadron under the command of the Brigade. There are some 442 men on this list indicating a fair rate of turnover in personnel over the period the 2nd Light Horse Machine Gun Squadron was in existence. The authorised war establishment of a squadron was 156 men. 2249 Private Harold Basil ADDEMS, a 21 year old Labourer from Van Sittart Park, South Australia. He enlisted on 22 November 1915 with the 6th Light Horse Regiment, 15th Reinforcements. At the conclusion of the war, he Returned to Australia, 9 July 1919. 72 Driver Bert ALLEN, a 19 year old Labourer from Orange, New South Wales. He enlisted on 3 September 1914 with the 6th Light Horse Regiment, A Squadron. He subsequently Returned to Australia, 13 October 1918. 411 Private James Percy ALLERTON, a 20 year old Drover from Moss Vale, New South Wales. He enlisted on 27 October 1914 with the 7th Light Horse Regiment, B Squadron. At the conclusion of the war, he Returned to Australia, 15 May 1919 . 1076 Private George APPLETON, a 22 year old Farmhand from Chitworth Rockdale, New South Wales. He enlisted on 6 March 1915 with the 6th Light Horse Regiment, 7th Reinforcements. At the conclusion of the war, he Returned to Australia, 8 October 1919. 358 Private Walter ARDEN, a 20 year old Stud groom from Wodonga, Victoria. He enlisted on 5 October 1914 with the 7th Light Horse Regiment, B Squadron. At the conclusion of the war, he Returned to Australia, 15 December 1918. 62 Private Richard John Edward ARMIT, a 29 year old Engine fitter from North Ward Townsville, Queensland. He enlisted on 21 September 1914 with the 5th Light Horse Regiment, Machine Gun Section. At the conclusion of the war, he Returned to Australia, 7 January 1919. 1385 Private John Henry ASKEW, a 19 year old Labourer from Bundaberg, Queensland. He enlisted on 5 August 1915 with the 5th Light Horse Regiment, 11th Reinforcements. At the conclusion of the war, he Returned to Australia, 27 June 1919. 1700 Private Albert Henry ATKINS, a 22 year old Labourer from Trunkey Creek Newbridge, New South Wales. He enlisted on 15 January 1916 with the 12th Light Horse Regiment, 8th Reinforcements. At the conclusion of the war, he Returned to Australia, 28 June 1919. 57368 Private Herbert AYRES, a 28 year old Motor Mechanic from Marrickville, New South Wales. He enlisted on 26 June 1918 with the 4th General Service Reinforcements, New South Wales . At the conclusion of the war, he Returned to Australia, 17 July 1919. 1232 Private Ernest BABB, a 22 year old Stationhand from Brisbane, Queensland. He enlisted on 28 April 1915 with the 5th Light Horse Regiment, 9th Reinforcements. He subsequently Returned to Australia, 15 February 1918. 10 Private Frank BALDWIN, a 35 year old Bushman from Glen Innes, New South Wales. He enlisted on 28 February 1915 with the 12th Light Horse Regiment, Regimental Headquarters. At the conclusion of the war, he Returned to Australia, 10 April 1919. 1308 Private Henry Albert BARBOUR, a 26 year old Grazier from Biarra via Esk, Queensland. He enlisted on 15 June 1915 with the 5th Light Horse Regiment, 10th Reinforcements. He subsequently Returned to Australia, 7 September 1916. 755 Private Alfred Henry BARKER, a 19 year old Stockman from Leichhardt, New South Wales. He enlisted on 17 November 1914 with the 7th Light Horse Regiment, 3rd Reinforcements. He subsequently was Killed in Action, 5 November 1917. 72 Private Owen Cressy BARRY, a 23 year old Sugar Cane inspector from Condong, New South Wales. He enlisted on 18 February 1915 with the 12th Light Horse Regiment, A Squadron. He subsequently was Killed in Action, 11 May 1918. 57242 Private Edward John BATTLE, a 19 year old Bank Clerk from Mount Morgan, Queensland. He enlisted on 11 June 1918 with the 4th General Service Reinforcements, Queensland . At the conclusion of the war, he Returned to Australia, 29 June 1919. 63984 Private Arthur Herbert BAUER, a 19 year old Butcher from Bundaberg, Queensland. He enlisted on 28 May 1918 with the 5th General Service Reinforcements, Queensland . At the conclusion of the war, he Returned to Australia, 18 July 1919. 2307 Acting Corporal Arthur James BEEDON, a 38 year old Traveller from Potts Pt, New South Wales. He enlisted on 26 July 1915 with the 7th Light Horse Regiment, 16th Reinforcements. At the conclusion of the war, he Returned to Australia, 28 June 1919. 1007 Private Arthur Thomas BEEZLEY, a 21 year old Labourer from Petersham, New South Wales. He enlisted on 24 February 1915 with the 6th Light Horse Regiment, 6th Reinforcements. At the conclusion of the war, he Returned to Australia, 14 July 1919. 2634 Private Francis Aubrey BELBIN, a 26 year old Type repairer from Rozelle, New South Wales. He enlisted on 14 December 1915 with the 6th Light Horse Regiment, 18th Reinforcements. He subsequently Returned to Australia, 21 November 1916. 836 Private Clive Roy BELL, a 20 year old Labourer from Adelong, New South Wales. He enlisted on 10 March 1915 with the 12th Light Horse Regiment, 2nd Reinforcements. He subsequently Returned to Australia, 30 August 1918. 617 Private Edward William BELL, a 24 year old Bushman from Brewarrina, New South Wales. He enlisted on 25 November 1914 with the 6th Light Horse Regiment, Machine Gun Section. At the conclusion of the war, he Returned to Australia, 15 November 1918. 1702 Private Edwin BELL, a 20 year old Labourer from Kangeroo Pt, Queensland. He enlisted on 18 August 1915 with the 5th Light Horse Regiment, 11th Reinforcements. At the conclusion of the war, he Returned to Australia, 27 June 1919. 1616 Private Joseph Charles BELL, a 23 year old Railworker from Tighes Hill, New South Wales. He enlisted on 7 September 1915 with the 7th Light Horse Regiment, 12th Reinforcements. At the conclusion of the war, he Returned to Australia, 9 July 1919. 1761 Private Charles Alexander Stephen BENNETT, a 37 year old Farm Labourer from Liverpool, New South Wales. He enlisted on 10 January 1916 with the 12th Light Horse Regiment, 9th Reinforcements. At the conclusion of the war, he Returned to Australia, 27 June 1919. 3508 Private Thomas BENSON, a 26 year old Groom from Albury, New South Wales. He enlisted on 20 January 1917 with the 3rd Light Horse Regiment, 30th Reinforcements. At the conclusion of the war, he Returned to Australia, 28 June 1919 . 584 Temporary Quartermaster Sergeant Thomas Joshus BERESFORD, a 24 year old Labourer from Cottesloe, Western Australia. He enlisted on 8 November 1914 with the 5th Light Horse Regiment, 1st Reinforcements. At the conclusion of the war, he Returned to Australia, 23 December 1918. 2810 Private Sydney Newman BICKLE, a 20 year old Labourer from Brisbane, Queensland. He enlisted on 8 February 1916 with the 5th Light Horse Regiment, 19th Reinforcements. At the conclusion of the war, he Returned to Australia, 27 June 1919. 706A Private James Reginald BLOOMFIELD, a 19 year old Blacksmith from Moree, New South Wales / Donroy Station, New South Wales. He enlisted on 1 November 1914 with the 1st Light Horse Regiment, 2nd Reinforcements. At the conclusion of the war, he Returned to Australia, 23 December 1918. 686 Private Neil BOOMER, a 22 year old Veterinary assistant from Brisbane, Queensland. He enlisted on 16 December 1914 with the 5th Light Horse Regiment, C Squadron. He subsequently Returned to Australia, 11 July 1917. 1610 Private Valentine Charles BOOTHBY, a 24 year old Farmer from Lismore, New South Wales. He enlisted on 23 October 1916 with the Imperial Camel Corps, 7th Reinforcements. At the conclusion of the war, he Returned to Australia, 14 March 1919. 3587 Private Sidney BOURKE, a 21 year old Labourer from Coolamon, New South Wales. He enlisted on 11 June 1917 with the 6th Light Horse Regiment, 32nd Reinforcements. At the conclusion of the war, he Returned to Australia, 27 June 1919. 3279 Private Alfred Edward BRADLEY, a 27 year old Stationhand from Woolloomooloo, New South Wales. He enlisted on 17 April 1917 with the Imperial Camel Corps, 12th Reinforcements. At the conclusion of the war, he Returned to Australia, 27 June 1919. 2456 Acting Corporal Harold Thomas L.eslie BRADY, a 23 year old Draper from Richmond, Victoria. He enlisted on 6 October 1915 with the 6th Light Horse Regiment, 17th Reinforcements. At the conclusion of the war, he Returned to Australia, 28 December 1918. 2151 Acting Sergeant Frederick Dudley BRANGHAM, a 29 year old Grazier from Kaiyuta via Warra, Queensland. He enlisted on 4 October 1915 with the 5th Light Horse Regiment, 15th Reinforcements. At the conclusion of the war, he Returned to Australia, 22 September 1919. 3348 Private Annsley Rollo Grey BRETT, a 25 year old Farmer from Urana, New South Wales. He enlisted on 19 January 1917 with the 7th Light Horse Regiment, 28th Reinforcements. At the conclusion of the war, he Returned to Australia, 17 July 1919. 2807 Private Edwin William BRIDLE, a 19 year old Grocer from Rosevale, New South Wales. He enlisted on 19 January 1916 with the 6th Light Horse Regiment, 19th Reinforcements. At the conclusion of the war, he Returned to Australia, 28 June 1919. 2153 Private Wilfred John BRIMBLECOMBE, an 18 year old Farmer from Forrest Hill, Queensland. He enlisted on 13 September 1915 with the 5th Light Horse Regiment, 15th Reinforcements. At the conclusion of the war, he Returned to Australia, 28 June 1919. 486 Private James BROWN, a 22 year old Contractor from Sydney, New South Wales. He enlisted on 14 September 1914 with the 6th Light Horse Regiment, 1st Reinforcements. At the conclusion of the war, he Returned to Australia, 15 November 1918. 1228 Private Walter BROWN, a 38 year old Saddler from Adelong, New South Wales. He enlisted on 11 June 1915 with the 7th Light Horse Regiment, 9th Reinforcements. At the conclusion of the war, he Returned to Australia, 28 June 1919. 52634 Private Claude BRUCE, a 19 year old Wood Cutter from Brisbane, Queensland. He enlisted on 11 May 1918 with the 2nd General Service Reinforcements, Queensland . At the conclusion of the war, he Returned to Australia, 28 June 1919. 18 Private Leslie Arthur BRYSON, a 23 year old Clerk from Goulburn, New South Wales. He enlisted on 14 September 1914 with the 6th Light Horse Regiment, Regimental Headquarters. At the conclusion of the war, he Returned to Australia, 17 July 1919. 2874 Private Arthur Roy BUCKLAND, a 29 year old Grazier from Leadville, New South Wales. He enlisted on 21 February 1916 with the 7th Light Horse Regiment, 20th Reinforcements. At the conclusion of the war, he Returned to Australia, 27 June 1919. 380 Private William Ronald BURCHILL, a 27 year old Driver from Manly, New South Wales. He enlisted on 16 September 1914 with the 6th Light Horse Regiment, C Squadron. At the conclusion of the war, he Returned to Australia, 18 December 1918. 930 Private Patrick BURKE, a 21 year old Stationhand from Bundarra, New South Wales. He enlisted on 17 December 1914 with the 5th Light Horse Regiment, 5th Reinforcements. At the conclusion of the war, he Returned to Australia, 27 June 1919. 1449 Private William BURNS, a 41 year old Miner from Orange, New South Wales. He enlisted on 20 August 1915 with the 6th Light Horse Regiment, 11th Reinforcements. He subsequently Returned to Australia, 21 January 1917. 153 Trumpeter Sergeant John Robert CAIN, a 29 year old Clerk from Goondwindi, Queensland. He enlisted on 1 October 1914 with the 5th Light Horse Regiment, Machine Gun Section. At the conclusion of the war, he Returned to Australia, 27 June 1919. 860 Private Archibald Athol CAMERON, a 27 year old Farmer from Gunnedah, New South Wales. He enlisted on 2 February 1915 with the 7th Light Horse Regiment, 4th Reinforcements. At the conclusion of the war, he Returned to Australia, 22 September 1919. 2891 Private McRae Archibald CAMERON, an 18 year old Stationhand from Glen Innes, New South Wales. He enlisted on 15 March 1916 with the 7th Light Horse Regiment, 20th Reinforcements. At the conclusion of the war, he Returned to Australia, 17 July 1919. 2637 Private William Donald CAMERON, a 27 year old Grazier from Gowrie Guyra, New South Wales. He enlisted on 13 December 1915 with the 6th Light Horse Regiment, 18th Reinforcements. At the conclusion of the war, he Returned to Australia, 27 June 1919. 2812 Private Alexander Buchanan CAMPBELL, a 19 year old Labourer from Rockhampton, Queensland. He enlisted on 16 February 1916 with the 5th Light Horse Regiment, 19th Reinforcements. At the conclusion of the war, he Returned to Australia, 9 January 1920. 2324 Private Byron Aubrey CAMPBELL, a 24 year old Jackeroo from Moree, New South Wales. He enlisted on 24 September 1915 with the 7th Light Horse Regiment, 16th Reinforcements. At the conclusion of the war, he Returned to Australia, 9 July 1919. 15096 Private George Norman Strachan CAMPBELL, a 20 year old Clerk from Malvern, Victoria. He enlisted on 2 March 1916 with the 14th Australian General Hospital, Headquarters. At the conclusion of the war, he Returned to Australia, 26 January 1919. 2884 Private Bruce Farquhar CAPEL, a 26 year old Overseer from Derra Derra, New South Wales. He enlisted on 31 January 1916 with the 7th Light Horse Regiment, 20th Reinforcements. At the conclusion of the war, he Returned to Australia, 27 June 1919. 1619 Private Daniel CARBERRY, a 20 year old Labourer from Dubbo, New South Wales. He enlisted on 30 August 1915 with the 7th Light Horse Regiment, 12th Reinforcements. At the conclusion of the war, he Returned to Australia, 27 June 1919. 1618 Private Eric CARBERRY, a 19 year old Labourer from Junee, New South Wales. He enlisted on 30 August 1915 with the 7th Light Horse Regiment, 12th Reinforcements. At the conclusion of the war, he Returned to Australia, 27 June 1919. 4481 Private Edwin William CARR, an 18 year old Student from Rose Bay, New South Wales. He enlisted on 5 October 1917 with the Light Horse Reinforcements . At the conclusion of the war, he Returned to Australia, 4 March 1919. 52693 Private Vince CARR, a 34 year old Clerk from Dubbo, New South Wales. He enlisted on 12 February 1918 with the 2nd General Service Reinforcements, New South Wales . At the conclusion of the war, he Returned to Australia, 27 June 1919. 1381 Private John McGill CARSON, a 24 year old Grazier from Culgoora, New South Wales. He enlisted on 11 August 1915 with the 12th Light Horse Regiment, 7th Reinforcements. At the conclusion of the war, he Returned to Australia, 25 September 1919. 1076 Private Joseph CARTER, a 21 year old Labourer from Stewarts Brook via Scone, New South Wales. He enlisted on 13 January 1915 with the 12th Light Horse Regiment, 5th Reinforcements. At the conclusion of the war, he Returned to Australia, 26 January 1919. 2873 Private William George CASTLE, a 38 year old Blacksmith from Cummingham, Queensland. He enlisted on 7 March 1916 with the 5th Light Horse Regiment, 20th Reinforcements. At the conclusion of the war, he Returned to Australia, 4 March 1919. 3532 Private Frank CATORALL, a 21 year old Striker from Leichhardt, New South Wales. He enlisted on 7 May 1917 with the 7th Light Horse Regiment, 31st Reinforcements. At the conclusion of the war, he Returned to Australia, 27 June 1919. 1009 Private Alfred CHAPMAN, an 18 year old Farmer from Inglewood, New South Wales. He enlisted on 8 February 1915 with the 7th Light Horse Regiment, 6th Reinforcements. He subsequently was Killed in Action, 5 November 1917. 1006 Private Benjamin Barnett CHAPMAN, an 18 year old Labourer from Spring Hill, New South Wales. He enlisted on 8 February 1915 with the 7th Light Horse Regiment, 6th Reinforcements. At the conclusion of the war, he Returned to Australia, 27 June 1919. 1705 Private Frederick Henry CHAPMAN, a 26 year old Labourer from Cassilis, New South Wales. He enlisted on 31 August 1915 with the 12th Light Horse Regiment, 8th Reinforcements. At the conclusion of the war, he Returned to Australia, 10 July 1919. 687 Private Hubert Harold CHARLESWORTH, a 21 year old Farmer from Rosedale, New South Wales. He enlisted on 23 September 1914 with the 6th Light Horse Regiment, B Squadron. He subsequently Returned to Australia, 12 July 1918. 2638 Private Alfred George CHARLISH, a 21 year old Dairyhand from Longueville, New South Wales. He enlisted on 3 January 1916 with the 7th Light Horse Regiment, 18th Reinforcements. At the conclusion of the war, he Returned to Australia, 28 June 1919. 566 Private Eric Leslie CHAUNCEY, an 18 year old Farmer from Narrandera, New South Wales. He enlisted on 1 December 1914 with the 6th Light Horse Regiment, 1st Reinforcements. At the conclusion of the war, he Returned to Australia, 25 December 1918. 35 Private Archibald CHEFFINS, a 27 year old Painter from Bowen, Queensland. He enlisted on 17 September 1914 with the 5th Light Horse Regiment, Regimental Headquarters. At the conclusion of the war, he Returned to Australia, 2 March 1919. 2462A Private Arthur William CHIDGEY, a 33 year old Wood machinist from Ballina, New South Wales. He enlisted on 11 January 1916 with the 7th Light Horse Regiment, 17th Reinforcements. At the conclusion of the war, he Returned to Australia, 22 December 1918. 149 Driver Thomas CHRISTENSEN, a 19 year old Grocer from Brisbane, Queensland. He enlisted on 24 September 1914 with the 5th Light Horse Regiment, Machine Gun Section. At the conclusion of the war, he Returned to Australia, 15 November 1918. 1119 Private Henry Boyd CLARK, a 23 year old Coalminer from Scone, New South Wales. He enlisted on 16 July 1915 with the 12th Light Horse Regiment, 5th Reinforcements. At the conclusion of the war, he Returned to Australia, 14 March 1919. 2461 Private Patrick CLARKSON, an 18 year old Labourer from Indooroopily, Queensland. He enlisted on 11 October 1915 with the 5th Light Horse Regiment, 17th Reinforcements. At the conclusion of the war, he Returned to Australia, 26 July 1919. 2813 Private Edward Charles COHEN, a 20 year old Station Overseer from Sydney, New South Wales. He enlisted on 11 March 1916 with the 7th Light Horse Regiment, 19th Reinforcements. At the conclusion of the war, he Returned to Australia, 26 December 1918. 398 Private Owen COLEBROOK, an 18 year old Farmer from Cooroy, Queensland. He enlisted on 11 April 1916 with the 13th Machine Gun Compan, 5th Reinforcements. At the conclusion of the war, he Returned to Australia, 4 June 1919. 1240 Private Joseph COLEMAN, a 20 19 year old Clerk from Longreach, Queensland. He enlisted on 18 August 1915 with the 11th Light Horse Regiment, 6th Reinforcements. At the conclusion of the war, he Returned to Australia, 27 June 1919. 3351 Private Thomas Dominic COLGAN, an 18 year old Farmlabourer from Beechwood, New South Wales. He enlisted on 28 March 1917 with the 6th Light Horse Regiment, 28th Reinforcements. At the conclusion of the war, he Returned to Australia, 28 June 1919. 522 Private Robert Alfred COLLUM, a 21 year old Grocer from Penrith, New South Wales. He enlisted on 29 October 1914 with the 7th Light Horse Regiment, C Squadron. At the conclusion of the war, he Returned to Australia, 23 December 1918. 83 Private William James CONNELLY, a 24 year old Carpenter from Nth Sydney, New South Wales. He enlisted on 3 November 1914 with the 7th Light Horse Regiment, Machine Gun Section. At the conclusion of the war, he Returned to Australia, 15 November 1918. 2460 Acting Sergeant Thomas COONEY, a 23 year old Labourer from Cooroy, Queensland. He enlisted on 10 January 1916 with the 5th Light Horse Regiment, 17th Reinforcements. At the conclusion of the war, he Returned to Australia, 27 June 1919. 489 Private Frederick Sydney CORNETT, a 20 year old Station hand from Trundle, New South Wales. He enlisted on 12 September 1914 with the 6th Light Horse Regiment, Machine Gun Section. At the conclusion of the war, he Returned to Australia, 26 December 1918. 3410 Private William Donald COUGHLAN, a 31 year old Stockman from Emmerville, New South Wales. He enlisted on 5 April 1917 with the 6th Light Horse Regiment, 29th Reinforcements. At the conclusion of the war, he Returned to Australia, 28 June 1919. 52640 Private Bert COX, an 18 year old Farmer from Murwillumbah, New South Wales. He enlisted on 20 April 1918 with the 2nd General Service Reinforcements, Queensland . At the conclusion of the war, he Returned to Australia, 28 June 1919. 2639 Private Harry King CRANNY, a 34 year old Salesman from Sydney, New South Wales. He enlisted on 22 November 1915 with the 6th Light Horse Regiment, 18th Reinforcements. He subsequently Returned to Australia, 8 March 1917. 3474 Private William CRAVINO, a 22 year old Billardmaker from Wellington, New South Wales. He enlisted on 27 June 1917 with the 6th Light Horse Regiment, 30th Reinforcements. At the conclusion of the war, he Returned to Australia, 26 July 1919. 2869 Lance Corporal William Charles CRISP, a 22 year old Farm Labourer from Toowoomba, Queensland. He enlisted on 20 March 1916 with the 5th Light Horse Regiment, 20th Reinforcements. At the conclusion of the war, he Returned to Australia, 29 December 1918. 2871 Private George Edward CULLEN, a 22 year old Labourer from Pine Ridge Southport, Queensland. He enlisted on 17 March 1916 with the 5th Light Horse Regiment, 20th Reinforcements. At the conclusion of the war, he Returned to Australia, 29 April 1919. 359 Private Andrew Twyman CUNNINGHAM, a 23 year old Pastoralist from Queenbeyan, New South Wales. He enlisted on 28 August 1914 with the 1st Light Horse Regiment, B Squadron. At the conclusion of the war, he Returned to Australia, 8 May 1919. 2809 Private Douglas CURRAN, a 17 year old Groom from Grahamstown, New South Wales. He enlisted on 26 September 1915 with the 6th Light Horse Regiment, 19th Reinforcements. He subsequently Died of Wounds, 20 April 1918. 3414 Private Charles DARCY, a 25 year old Jockey from Cunnamulla, Queensland. He enlisted on 25 April 1917 with the 5th Light Horse Regiment, 29th Reinforcements. At the conclusion of the war, he Returned to Australia, 29 April 1919 . 57473 Private Redvers Oliver DAVIDSON, an 18 year old Student from St Arnaud, Victoria. He enlisted on 22 March 1918 with the 4th General Service Reinforcements, Victoria . At the conclusion of the war, he Returned to Australia, 28 June 1919. 3415 Private Thomas Trewynn DAVIES, a 19 year old Horsebreaker from Glebs Pt, New South Wales. He enlisted on 4 May 1917 with the 7th Light Horse Regiment, 29th Reinforcements. At the conclusion of the war, he Returned to Australia, 29 April 1919. 1243 Private John Keighley DENNY, a 21 year old Sawyer from Sth Brisbane, Queensland. He enlisted on 19 June 1915 with the 5th Light Horse Regiment, 9th Reinforcements. At the conclusion of the war, he Returned to Australia, 28 June 1919. 1874 Private Eric Fanc DeSALIS, a 21 year old Stationhand from Michelago, New South Wales. He enlisted on 20 August 1915 with the 6th Light Horse Regiment, 13th Reinforcements. He subsequently was Killed in Action, 5 November 1917. 3382 Private Matthew DICKIE, a 21 year old Carpenter from Hurstville, New South Wales. He enlisted on 24 April 1917 with the 7th Light Horse Regiment, 28th Reinforcements. At the conclusion of the war, he Returned to Australia, 28 June 1919. 659 Private Richard Brownlow DIXON, a 27 year old Farmer from Tamworth, New South Wales. He enlisted on 24 February 1915 with the 12th Light Horse Regiment, Machine Gun Section. At the conclusion of the war, he Returned to Australia, 28 June 1919. 765 Private William John DOBBINS, a 25 year old Labourer from Longreach, Queensland. He enlisted on 21 December 1914 with the 5th Light Horse Regiment, 3rd Reinforcements. At the conclusion of the war, he Returned to Australia, 5 March 1919. 711 Private Thomas DONALDSON, a 27 year old Waggon maker from Bundamba, Queensland. He enlisted on 14 December 1914 with the 5th Light Horse Regiment, 2nd Reinforcements. At the conclusion of the war, he Returned to Australia, 5 March 1919. 501 Private Edward DONOVAN, a 30 year old Farmer from Lismore, New South Wales. He enlisted on 25 August 1914 with the 2nd Light Horse Regiment, C Squadron. At the conclusion of the war, he Returned to Australia, 23 December 1918. 3554 Private Rowland Arthur DOWLING, a 21 year old Labourer from Manilla, New South Wales. He enlisted on 24 May 1917 with the 6th Light Horse Regiment, 31st Reinforcements. At the conclusion of the war, he Returned to Australia, 28 June 1919. 373 Private William Edward DOWNIE, an 18 year old Labourer from Woonona, New South Wales. He enlisted on 7 October 1914 with the 7th Light Horse Regiment, B Squadron. At the conclusion of the war, he Returned to Australia, 15 November 1918. 153 Private William Bruce DUNCAN, a 20 year old Labourer from Ravensworth, New South Wales. He enlisted on 8 October 1914 with the 7th Light Horse Regiment, A Squadron. He subsequently Returned to Australia, 22 January 1917. 2876 Temporary Signaller William DUNNING, a 21 year old Plumber from Paddington, Queensland. He enlisted on 29 March 1916 with the 5th Light Horse Regiment, 20th Reinforcements. At the conclusion of the war, he Returned to Australia, 28 June 1919. 2902 Private Harry Howard DURRELL, a 29 year old Station Manager from Petersham, New South Wales. He enlisted on 14 February 1916 with the 7th Light Horse Regiment, 20th Reinforcements. At the conclusion of the war, he Returned to Australia, 15 January 1919. 122 Private Clarence Joseph DWYER, a 23 year old Drover from Tenterfield, New South Wales. He enlisted on 13 January 1915 with the 12th Light Horse Regiment, A Squadron. At the conclusion of the war, he Returned to Australia, 5 July 1919. 501 Private Walter Ernest DWYER, a 28 year old Labourer from Inglewood, Queensland. He enlisted on 2 November 1914 with the 5th Light Horse Regiment, C Squadron. He subsequently Returned to Australia, 13 October 1918. 2464 Private William Stanley DYSON, a 22 year old Labourer from Kempsey, New South Wales. He enlisted on 4 January 1916 with the 7th Light Horse Regiment, 17th Reinforcements. At the conclusion of the war, he Returned to Australia, 28 June 1919. 3479 Private George EASON, a 36 year old Assayer from Coonamble, New South Wales. He enlisted on 11 May 1917 with the 6th Light Horse Regiment, 30th Reinforcements. At the conclusion of the war, he Returned to Australia, 22 December 1918. 1774 Private Hugh Basil Knox EDWARDES, a 21 year old Farmer from Nth Sydney, New South Wales. He enlisted on 14 February 1916 with the 12th Light Horse Regiment, 9th Reinforcements. At the conclusion of the war, he Returned to Australia, 25 April 1919. 3777 Private Cyril John EGAN, a 21 year old Engineer from Waverley, New South Wales. He enlisted on 14 September 1917 with the 7th Light Horse Regiment, 35th Reinforcements. At the conclusion of the war, he Returned to Australia, 28 June 1919. 3420 Private Thomas Henry ELLIOTT, a 28 year old Labourer from Darlinghurst, New South Wales. He enlisted on 20 March 1917 with the 7th Light Horse Regiment, 29th Reinforcements. At the conclusion of the war, he Returned to Australia, 28 June 1919. 3624 Private Tom EVANS, a 32 year old Smelter from Cardiff, New South Wales. He enlisted on 6 June 1917 with the 6th Light Horse Regiment, 32nd Reinforcements. At the conclusion of the war, he Returned to Australia, 28 June 1919. 2877 Private William James EVERDELL, a 24 year old farmer from Woodhill, Queensland. He enlisted on 5 April 1916 with the 5th Light Horse Regiment, 20th Reinforcements. At the conclusion of the war, he Returned to Australia, 26 September 1919. 3536 Private Hector Horace FAIRLEIGH, a 19 year old Blacksmith from Lorn, New South Wales. He enlisted on 8 May 1917 with the 7th Light Horse Regiment, 31st Reinforcements. At the conclusion of the war, he Returned to Australia, 28 June 1919. 3481 Private George Henry FAULKNER, an 18 year old Printersmate from Enfield, New South Wales. He enlisted on 6 June 1917 with the 6th Light Horse Regiment, 30th Reinforcements. At the conclusion of the war, he Returned to Australia, 27 June 1919. 3535 Private Earl Leslie FERRIS, an 18 year old Clerk from Wickham, New South Wales. He enlisted on 30 May 1917 with the 7th Light Horse Regiment, 31st Reinforcements. At the conclusion of the war, he Returned to Australia, 27 June 1919. 3025 Private Charles Harper FIELDER, an 18 year old Farmhand from Tamworth, New South Wales. He enlisted on 1 June 1916 with the 6th Light Horse Regiment, 22nd Reinforcements. At the conclusion of the war, he Returned to Australia, 28 June 1919. 639 Driver Joseph Francis FITZGERALD, a 22 year old Horse breaker from Warwick, Queensland. He enlisted on 13 November 1914 with the 5th Light Horse Regiment, Regimental Headquarters. At the conclusion of the war, he Returned to Australia, 28 January 1919. 1392 Private Archibald Samuel FITZGIBBON, a 26 year old Butcher from Queenbeyan, New South Wales. He enlisted on 27 August 1915 with the 12th Light Horse Regiment, 7th Reinforcements. At the conclusion of the war, he Returned to Australia, 28 June 1919. 3417 Private Carl FLEISCHFRESSER, a 21 year old Farmer from Toowoomba, Queensland. He enlisted on 25 April 1917 with the 5th Light Horse Regiment, 29th Reinforcements. At the conclusion of the war, he Returned to Australia, 28 June 1919. 3421 Private James Binnie FLEMING, a 30 year old Manager from Waratah via Newcastle, New South Wales. He enlisted on 16 March 1917 with the 7th Light Horse Regiment, 29th Reinforcements. At the conclusion of the war, he Returned to Australia, 28 June 1919. 74 Private George Peirce FOOT, a 29 year old Bushman from Cardigan, Queensland. He enlisted on 17 September 1914 with the 5th Light Horse Regiment, Machine Gun Section. He subsequently Returned to Australia, 22 January 1917. 331 Private William James Claude FOOTE, a 20 year old Farmhand from Chatswood, New South Wales. He enlisted on 14 September 1914 with the 6th Light Horse Regiment, B Squadron. At the conclusion of the war, he Returned to Australia, 15 January 1919. 3051 Private Arthur George FORREST, a 36 year old Farmer from Forrest Vale, New South Wales. He enlisted on 25 January 1916 with the 6th Light Horse Regiment, 23rd Reinforcements. At the conclusion of the war, he Returned to Australia, 16 March 1919. 103 Private Frederick Richard FOX, a 44 year old Civil servant from Leederville, Western Australia. He enlisted on 20 June 1917 with the 1st Light Horse Machine Gun Squadron, 5th Reinforcements. At the conclusion of the war, he Returned to Australia, 2 August 1919. 2176 Private Jack Hughie Belmore FRASER, a 22 year old Stockman from Georgetown, Queensland. He enlisted on 3 September 1915 with the 5th Light Horse Regiment, 15th Reinforcements. At the conclusion of the war, he Returned to Australia, 4 March 1919. 1124 Private Reuben FREEMAN, a 20 year old Labourer from Sth Brisbane, Queensland. He enlisted on 18 March 1915 with the 5th Light Horse Regiment, 7th Reinforcements. At the conclusion of the war, he Returned to Australia, 28 June 1919. 537 Private Frank William FREESTONE, a 25 year old Boundryrider from Mascot, New South Wales. He enlisted on 7 November 1914 with the 5th Light Horse Regiment, C Squadron. He subsequently was Killed in Action, 10 November 1917. 1775 Private Frank FRETUS, a 36 year old Stonemason from Sutherland, New South Wales. He enlisted on 1 December 1915 with the 12th Light Horse Regiment, 9th Reinforcements. He subsequently Returned to Australia, 23 September 1916. 1786 Private Martin FROST, a 26 year old Shearer from Bundarra, New South Wales. He enlisted on 17 September 1915 with the 12th Light Horse Regiment, 9th Reinforcements. At the conclusion of the war, he Returned to Australia, 4 March 1919. 3744 Private Maurice James GALLAGHER, a 22 year old Labourer from Bywong, New South Wales. He enlisted on 29 June 1917 with the 7th Light Horse Regiment, 34th Reinforcements. At the conclusion of the war, he Returned to Australia, 29 April 1919. 3356 Private William John GALLAGHER, a 23 year old Shearer from Bungendore, New South Wales. He enlisted on 16 February 1917 with the 6th Light Horse Regiment, 28th Reinforcements. At the conclusion of the war, he Returned to Australia, 28 June 1919. 1712 Private William Vincent GALLAGHER, a 24 year old Miner from Corrimal, New South Wales. He enlisted on 8 January 1916 with the 12th Light Horse Regiment, 8th Reinforcements. At the conclusion of the war, he Returned to Australia, 20 July 1919. 2464 Private Nathaniel John GARDINER, a 21 year old Labourer from Sydney, New South Wales. He enlisted on 30 December 1915 with the 6th Light Horse Regiment, 17th Reinforcements. At the conclusion of the war, he Returned to Australia, 28 June 1919. 2878 Private Wilfred Immanual GARNER, a 21 year old Saddler from Swan Hill, Queensland. He enlisted on 13 March 1916 with the 5th Light Horse Regiment, 20th Reinforcements. At the conclusion of the war, he Returned to Australia, 28 June 1919. 2881 Private Eric Reginald GARRETT, a 25 year old Station Overseer from Sydney, New South Wales. He enlisted on 25 February 1916 with the 7th Light Horse Regiment, 20th Reinforcements. At the conclusion of the war, he Returned to Australia, 17 July 1919. 56977 Private Edward George GARTH, a 21 year old Jockey from Windsor, Victoria. He enlisted on 20 November 1917 with the 3rd General Service Reinforcements, Victoria . At the conclusion of the war, he Returned to Australia, 28 June 1919. 2467 Private William Henry GARTON, a 21 year old Labourer from Maryborough, Queensland. He enlisted on 25 August 1915 with the 5th Light Horse Regiment, 17th Reinforcements. At the conclusion of the war, he Returned to Australia, 28 June 1919. 3417 Private Charles Henry GAY, a 25 year old Labourer from 4 Mile Creek Cadia, New South Wales. He enlisted on 4 November 1916 with the 6th Light Horse Regiment, 29th Reinforcements. At the conclusion of the war, he Returned to Australia, 27 June 1919. 2178 Private Roy GEORGE, an 18 year old Stockman from Cargoom via Pentland, Queensland. He enlisted on 6 September 1915 with the 5th Light Horse Regiment, 15th Reinforcements. He subsequently Died of Wounds, 8 November 1917. 2184 Private James GERAGHTY, an 18 year old Stockman from Thornville via Oakey, Queensland. He enlisted on 9 October 1915 with the 5th Light Horse Regiment, 15th Reinforcements. He subsequently Returned to Australia, 22 January 1917. 80 Private Arthur William GIBBS, a 25 year old Drover from Inverell, New South Wales. He enlisted on 28 October 1914 with the 7th Light Horse Regiment, Machine Gun Section. At the conclusion of the war, he Returned to Australia, 15 November 1918. 2178 Private Harold Henry GIBBS, a 20 year old Farmer from Williamsdale, New South Wales. He enlisted on 19 September 1915 with the 6th Light Horse Regiment, 15th Reinforcements. At the conclusion of the war, he Returned to Australia, 28 June 1919. 895 Private Leslie GIBBS, a 20 year old Hunter from Liverppol, New South Wales. He enlisted on 18 February 1915 with the 17th Infantry Battalion, C Squadron. He subsequently Returned to Australia, 12 April 1917. 2486 Private Alexander GIBSON, a 25 year old Labourer from Charters towers, Queensland. He enlisted on 4 December 1915 with the 5th Light Horse Regiment, 17th Reinforcements. At the conclusion of the war, he Returned to Australia, 16 March 1919. 728 Private Francis William GILES, a 25 year old Labourer from Newtown, New South Wales. He enlisted on 9 December 1914 with the 7th Light Horse Regiment, 2nd Reinforcements. At the conclusion of the war, he Returned to Australia, 28 June 1919. 2942 Private George GILLIS, a 20 year old Labourer from Toowoomba, Queensland. He enlisted on 29 March 1916 with the 5th Light Horse Regiment, 21st Reinforcements. At the conclusion of the war, he Returned to Australia, 16 April 1920. 2181 Private Robert GLAZEBROOK, a 27 year old Station Hand from Double Bay, New South Wales. He enlisted on 15 November 1915 with the 6th Light Horse Regiment, 15th Reinforcements. At the conclusion of the war, he Returned to Australia, 28 June 1919. 56978 Private Herbert GOWER, a 32 year old Commercial Traveller from Randwick, New South Wales. He enlisted on 28 January 1918 with the 3rd General Service Reinforcements, New South Wales . At the conclusion of the war, he Returned to Australia, 29 April 1919. 2928 Private Joseph Aliphus GRAVOLIN, a 29 year old Floorman from Milsons Pt, New South Wales. He enlisted on 9 February 1916 with the 6th Light Horse Regiment, 21st Reinforcements. At the conclusion of the war, he Returned to Australia, 28 June 1919. 1710 Private Leslie Winchombe GREGORY, a 23 year old Sawmiller from Casino, New South Wales. He enlisted on 26 July 1915 with the 7th Light Horse Regiment, 11th Reinforcements. At the conclusion of the war, he Returned to Australia, 4 March 1919. 727 Private Angus Mackie GRIFFITHS, a 22 year old Labourer from Double Gates Hotel Cobar, New South Wales. He enlisted on 28 November 1914 with the 7th Light Horse Regiment, 2nd Reinforcements. At the conclusion of the war, he Returned to Australia, 14 March 1919. 2335 Private Fred Sidney GRUNDY, a 30 year old Driver from Mascot, New South Wales. He enlisted on 26 September 1915 with the 7th Light Horse Regiment, 16th Reinforcements. At the conclusion of the war, he Returned to Australia, 15 March 1919. 1478 Private Walter Clifford HAGAN, an 18 year old Boundryrider from Apple Green, New South Wales. He enlisted on 5 July 1915 with the 6th Light Horse Regiment, 11th Reinforcements. At the conclusion of the war, he Returned to Australia, 28 June 1919. 3480 Private Charles Norman HAILES, an 18 year old Shopworker from Teralba, New South Wales. He enlisted on 12 May 1917 with the 7th Light Horse Regiment, 30th Reinforcements. At the conclusion of the war, he Returned to Australia, 28 June 1919. 2045 Private Archibald HALL, a 21 year old Labourer from Spring Hill, New South Wales. He enlisted on 13 September 1915 with the 7th Light Horse Regiment, 14th Reinforcements. At the conclusion of the war, he Returned to Australia, 28 June 1919. 429 Private Edward Daniel HAMILTON, a 24 year old Labourer from Tallangatta, Victoria. He enlisted on 4 November 1914 with the 7th Light Horse Regiment, B Squadron. At the conclusion of the war, he Returned to Australia, 23 December 1918. 3294 Private Albert Edgar HARDGRAVE, a 21 year old Farmer from Pound Hill Lismore, New South Wales. He enlisted on 9 February 1917 with the 6th Light Horse Regiment, 27th Reinforcements. At the conclusion of the war, he Returned to Australia, 15 March 1919. 2879 Private Edmund James HARDY, a 25 year old Policeman from Binalong, New South Wales. He enlisted on 27 January 1916 with the 6th Light Horse Regiment, 20th Reinforcements. At the conclusion of the war, he Returned to Australia, 28 June 1919. 3119 Private William HARKIN, a 26 year old Miner from Newton, Queensland. He enlisted on 13 November 1916 with the 5th Light Horse Regiment, 24th Reinforcements. At the conclusion of the war, he Returned to Australia, 28 June 1919. 1250 Private Richard Arthur HASSALL, a 22 year old Farmer from Tamworth, New South Wales. He enlisted on 1 May 1915 with the 5th Light Horse Regiment, 9th Reinforcements. At the conclusion of the war, he Returned to Australia, 28 June 1919. 621 Private Rowland Thomas HASSALL, a 21 year old Grazier from Braidwood, New South Wales. He enlisted on 8 June 1915 with the 12th Light Horse Regiment, C Squadron. At the conclusion of the war, he Returned to Australia, 22 February 1919. 626 Private Edward Laurence HAUBER, an 18 year old Grocer from Bowral, New South Wales. He enlisted on 15 November 1914 with the 7th Light Horse Regiment, 1st Reinforcements. At the conclusion of the war, he Returned to Australia, 18 December 1918. 2343 Private James Albert HAUBER, a 19 year old Carter from Bowral, New South Wales. He enlisted on 11 September 1915 with the 7th Light Horse Regiment, 16th Reinforcements. At the conclusion of the war, he Returned to Australia, 15 June 1919. 3258 Private Eugene HAYES, a 22 year old Labourer from Clayfield, Queensland. He enlisted on 14 October 1916 with the 5th Light Horse Regiment, 26th Reinforcements. At the conclusion of the war, he Returned to Australia, 22 January 1919. 82 Private William Henry HAYES, a 27 year old Labourer from Moama, New South Wales. He enlisted on 30 October 1914 with the 7th Light Horse Regiment, Machine Gun Section. At the conclusion of the war, he Returned to Australia, 15 November 1918. 1267 Private James Joseph Moor HAYLOCK, a 22 year old Farmer from Parramatta, New South Wales. He enlisted on 29 June 1915 with the 6th Light Horse Regiment, 9th Reinforcements. He subsequently Returned to Australia, 21 February 1917. 272 Private Samuel HENNEGAN, a 23 year old Horsedriver from Mt Morgan, Queensland. He enlisted on 23 October 1914 with the 5th Light Horse Regiment, A Squadron. At the conclusion of the war, he Returned to Australia, 15 November 1918 . 2345 Private William Osborne HERNE, a 26 year old Farmer from Termeil, New South Wales. He enlisted on 7 October 1915 with the 7th Light Horse Regiment, 16th Reinforcements. At the conclusion of the war, he Returned to Australia, 26 June 1919. 2880 Private Gerald Edwin HERRING, a 25 year old Farmhand from Mumbil, New South Wales. He enlisted on 31 January 1916 with the 6th Light Horse Regiment, 20th Reinforcements. At the conclusion of the war, he Returned to Australia, 28 June 1919. 1397 Private Percival Edward Snowdon HERRING, a 19 year old Labourer from Mumbil, New South Wales. He enlisted on 26 August 1915 with the 12th Light Horse Regiment, 7th Reinforcements. At the conclusion of the war, he Returned to Australia, 28 June 1919. 1620 Private George Albert James HIGHFIELD, a 28 year old Tuckerman from Gulgong, New South Wales. He enlisted on 12 August 1915 with the 6th Light Horse Regiment, 12th Reinforcements. At the conclusion of the war, he Returned to Australia, 15 June 1919. 104 Private Alfred Ernest HILL, a 38 year old Farmer from Wagin, Western Australia. He enlisted on 1 May 1917 with the 1st Light Horse Machine Gun Squadron, 5th Reinforcements. At the conclusion of the war, he Returned to Australia, 28 June 1919. 2929 Private Edgar Osmond HILL, a 32 year old Bookkeeper from Manly, New South Wales. He enlisted on 24 January 1916 with the 6th Light Horse Regiment, 21st Reinforcements. At the conclusion of the war, he Returned to Australia, 28 June 1919. 1738 Private Thomas William HILL, a 22 24 year old Storeman / Labourer from Pinjarrah, Western Australia. He enlisted on 8 July 1915 with the 10th Light Horse Regiment, 11th Reinforcements. He subsequently Returned to Australia, 6 August 1917. 771 Private Frederick William HINTON, a 32 year old Farmer from Brisbane, Queensland. He enlisted on 26 December 1914 with the 5th Light Horse Regiment, 3rd Reinforcements. At the conclusion of the war, he Returned to Australia, 6 October 1919. 2468 Private John HITCHCOCK, a 26 year old Labourer from New Farm, Queensland. He enlisted on 7 September 1915 with the 5th Light Horse Regiment, 17th Reinforcements. He subsequently Returned to Australia, 22 January 1917. 2815 Private Clifton Henry James HOAD, a 19 year old Mercer from Tumut, New South Wales. He enlisted on 19 January 1916 with the 6th Light Horse Regiment, 19th Reinforcements. He subsequently was Killed in Action, 5 November 1917. 2347 Private Alan John Henry HOBBS, a 25 year old Farmer from Corabell Creek, New South Wales. He enlisted on 6 December 1915 with the 7th Light Horse Regiment, 16th Reinforcements. At the conclusion of the war, he Returned to Australia, 10 April 1919. 3621 Private John Fletcher HOBBS, a 21 year old Labourer from GPO Sydney, New South Wales. He enlisted on 24 May 1917 with the 6th Light Horse Regiment, 32nd Reinforcements. At the conclusion of the war, he Returned to Australia, 16 May 1919. 1177 Acting Corporal Kenneth Charles Stewart HOBBS, a 20 year old Farmer from Coorabell Creek, New South Wales. He enlisted on 3 March 1915 with the 5th Light Horse Regiment, 8th Reinforcements. At the conclusion of the war, he Returned to Australia, 12 April 1919. 3353 Private Charles Roy HOCKING, a 21 year old Driver from Bowen on Hill, South Australia. He enlisted on 12 February 1917 with the 9th Light Horse Regiment, 28th Reinforcements. At the conclusion of the war, he Returned to Australia, 26 July 1919. 3423 Private Bernard Lawrence HOFFMAN, a 24 year old Farmer from Milong Young, New South Wales. He enlisted on 12 March 1917 with the 7th Light Horse Regiment, 29th Reinforcements. At the conclusion of the war, he Returned to Australia, 15 March 1919. 1715 Private Arthur Joseph HOGAN, an 18 year old Blacksmith from Stanmore, New South Wales. He enlisted on 19 November 1915 with the 12th Light Horse Regiment, 8th Reinforcements. At the conclusion of the war, he Returned to Australia, 20 July 1919. 2881 Private Henry Albert HOLDGATE, a 35 year old Grocer from Beaudesert, Queensland. He enlisted on 18 January 1916 with the 5th Light Horse Regiment, 20th Reinforcements. He subsequently was Killed in Action, 10 November 1917. 3722 Private Herbert Cecil Bramwell HOLLOWAY, an 18 year old Butcher from Bexley, New South Wales. He enlisted on 4 September 1917 with the Imperial Camel Corps, 14th Reinforcements. At the conclusion of the war, he Returned to Australia, 17 July 1919. 57435 Private Edgar Arthur HOLTHAM, an 18 year old Labourer from Murroon, Victoria. He enlisted on 26 April 1918 with the 4th General Service Reinforcements, Victoria . At the conclusion of the war, he Returned to Australia, 27 June 1919. 3000 Private Gordon Trescott HOOPER, a 21 year old Miller from Millhill, Queensland. He enlisted on 8 February 1916 with the 5th Light Horse Regiment, 22nd Reinforcements. At the conclusion of the war, he Returned to Australia, 27 June 1919. 493 Corporal Ernest Arthur HORNE, a 39 year old Farmer from Bathurst, New South Wales. He enlisted on 30 September 1914 with the 6th Light Horse Regiment, Machine Gun Section. At the conclusion of the war, he Returned to Australia, 15 November 1918. 1649 Private Arthur William HUDSON, an 18 year old Stationhand from Dunlop Stn, New South Wales. He enlisted on 2 August 1915 with the 7th Light Horse Regiment, 12th Reinforcements. At the conclusion of the war, he Returned to Australia, 28 June 1919. 2887 Private Herbert Alexander HUDSON, a 25 year old Grazier from Roxmere, New South Wales. He enlisted on 16 February 1916 with the 7th Light Horse Regiment, 20th Reinforcements. At the conclusion of the war, he Returned to Australia, 12 April 1919. 2879 Private William HUGHES, a 23 year old Carpenter from Murgon, Queensland. He enlisted on 28 March 1916 with the 5th Light Horse Regiment, 20th Reinforcements. At the conclusion of the war, he Returned to Australia, 28 June 1919. 2340 Private James Albert HULIN, a 23 year old Bushman from Meeleebee Stn, New South Wales. He enlisted on 24 November 1915 with the 6th Light Horse Regiment, 16th Reinforcements. At the conclusion of the war, he Returned to Australia, 1 April 1919. 406 Private John Edward Francis HULM, a 25 year old Labourer from Temora, New South Wales. He enlisted on 26 October 1914 with the 7th Light Horse Regiment, B Squadron. At the conclusion of the war, he Returned to Australia, 15 November 1918. 3781 Private Clive HUSBAND, a 19 year old Metalworker from Lewisham, New South Wales. He enlisted on 14 March 1917 with the 7th Light Horse Regiment, 35th Reinforcements. At the conclusion of the war, he Returned to Australia, 28 June 1919. 2645 Private Peter HUTCHINSON, a 26 year old Barman from Whittlesea, Victoria. He enlisted on 23 December 1915 with the 6th Light Horse Regiment, 18th Reinforcements. At the conclusion of the war, he Returned to Australia, 17 July 1919. Lieutenant Cyril William HUXTABLE, a 21 year old Soldier from La Perouse, New South Wales. He enlisted on 3 November 1914; and subsequently Returned to Australia, 8 March 1917. 2346 Private Merton Alfred HYAM, a 28 year old Dairyfarmer from Terara, New South Wales. He enlisted on 2 August 1915 with the 7th Light Horse Regiment, 16th Reinforcements. At the conclusion of the war, he Returned to Australia, 28 June 1919. 642 Private Ivan George IBBOTT, a 22 year old Telegraph operator from Kimberley, Tasmania. He enlisted on 30 September 1914 with the 1st Light Horse Regiment, 1st Reinforcements. At the conclusion of the war, he Returned to Australia, 15 November 1918. 41 Private Edward Bland INSCH, a 21 year old Labourer from Mackay, Queensland. He enlisted on 17 September 1914 with the 5th Light Horse Regiment, Machine Gun Section. At the conclusion of the war, he Returned to Australia, 15 November 1918. 3426 Private Roy James IRVINE, a 24 year old Farmer from Young, New South Wales. He enlisted on 3 March 1917 with the 7th Light Horse Regiment, 29th Reinforcements. At the conclusion of the war, he Returned to Australia, 27 June 1919 . 3056 Private Reginald Thomas Milton JACOBS, a 21 year old Stationhand from Annandale, New South Wales. He enlisted on 21 February 1917 with the 7th Light Horse Regiment, 23rd Reinforcements. At the conclusion of the war, he Returned to Australia, 25 June 1919. 2193 Private John William Joseph JAMES, a 23 year old Labourer from Rockhampton, Queensland. He enlisted on 26 August 1915 with the 5th Light Horse Regiment, 15th Reinforcements. He subsequently Returned to Australia, 12 November 1916 . 3798 Private Thomas JASPER, a 21 year old Grazier from The Maze, New South Wales. He enlisted on 14 September 1917 with the 7th Light Horse Regiment, 35th Reinforcements. At the conclusion of the war, he Returned to Australia, 28 June 1919. 348 Farrier Corporal Arthur JEFFERIS, a 37 year old Farrier from Bundaberg, Queensland. He enlisted on 26 October 1914 with the 5th Light Horse Regiment, A Squadron. He subsequently Returned to Australia, 30 August 1918. 2650 Private Charles Reginald JEFFERY, a 21 year old Grocer from Chatswood, New South Wales. He enlisted on 13 December 1915 with the 6th Light Horse Regiment, 18th Reinforcements. At the conclusion of the war, he Returned to Australia, 28 June 1919. 2817 Private William Arthur JENKINS, a 19 year old Tailor from Tumut, New South Wales. He enlisted on 19 January 1916 with the 6th Light Horse Regiment, 19th Reinforcements. At the conclusion of the war, he Returned to Australia, 6 July 1919. 588 Private Charles Tudor JOHNSON, a 20 year old Farmer from Cora Lynn, Victoria. He enlisted on 7 November 1914 with the 5th Light Horse Regiment, C Squadron. At the conclusion of the war, he Returned to Australia, 23 December 1918. 1465 Private Eric JOHNSON, a 22 year old Labourer from Charters Towers, Queensland. He enlisted on 16 August 1915 with the 5th Light Horse Regiment, 11th Reinforcements. At the conclusion of the war, he Returned to Australia, 15 November 1918. 3601 Private Thomas Frederick JOHNSON, a 28 year old Carter from Petersham, New South Wales. He enlisted on 16 April 1917 with the 7th Light Horse Regiment, 32nd Reinforcements. At the conclusion of the war, he Returned to Australia, 12 April 1919. 42 Private William George JOHNSTONE, a 32 year old Labourer from Rockhampton, Queensland. He enlisted on 17 September 1914 with the 5th Light Horse Regiment, Machine Gun Section. He subsequently Returned to Australia, 13 October 1918. 2466 Private William Reginald JOHNSTONE, a 28 year old Tramdriver from St Leonards, New South Wales. He enlisted on 6 December 1915 with the 6th Light Horse Regiment, 17th Reinforcements. He subsequently Returned to Australia, 21 May 1917. 335 Private Arthur JONES, an 18 year old Shopclerk from Temora, New South Wales. He enlisted on 9 February 1915 with the 12th Light Horse Regiment, B Squadron. At the conclusion of the war, he Returned to Australia, 24 July 1919. 105 Private Edward Ernest JONES, a 39 year old Hairdresser from Leederville, Western Australia. He enlisted on 14 May 1917 with the 1st Light Horse Machine Gun Squadron, 5th Reinforcements. At the conclusion of the war, he Returned to Australia, 27 June 1919. 3374 Private Howen JONES, a 21 year old Machinist from Gayndah, Queensland. He enlisted on 31 January 1917 with the 5th Light Horse Regiment, 28th Reinforcements. At the conclusion of the war, he Returned to Australia, 28 June 1919. 873 Private Frederick James JOYCE, a 21 year old Labourer from Gympie, Queensland. He enlisted on 2 January 1915 with the 5th Light Horse Regiment, 4th Reinforcements. At the conclusion of the war, he Returned to Australia, 15 March 1919. 3439 Private Thomas KELLY, an 18 year old Stockman from Cleveland, Queensland. He enlisted on 8 May 1917 with the 5th Light Horse Regiment, 29th Reinforcements. At the conclusion of the war, he Returned to Australia, 28 June 1919. 58 Driver Christopher John KESSLER, a 28 year old Grazier from Wombo, Queensland. He enlisted on 19 September 1914 with the 5th Light Horse Regiment, Machine Gun Section. At the conclusion of the war, he Returned to Australia, 5 March 1919. 593 Driver Joseph Francis KING, a 26 year old Labourer from Marrickville, New South Wales. He enlisted on 10 November 1914 with the 5th Light Horse Regiment, A Squadron. At the conclusion of the war, he Returned to Australia, 16 January 1919. 3684 Private Harold Raymond KLEEM, a 23 year old Farmer from Balmain, New South Wales. He enlisted on 1 November 1917 with the Imperial Camel Corps, 14th Reinforcements. At the conclusion of the war, he Returned to Australia, 28 June 1919. 3685 Private Hugh Wilford KLEEM, a 21 year old Farmer from Balmain, New South Wales. He enlisted on 1 November 1917 with the Imperial Camel Corps, 14th Reinforcements. At the conclusion of the war, he Returned to Australia, 28 June 1919. 2470 Private William Henry LACE, a 24 year old Miner from Charters Towers, Queensland. He enlisted on 18 November 1915 with the 5th Light Horse Regiment, 17th Reinforcements. At the conclusion of the war, he Returned to Australia, 28 June 1919. 2474 Private William Henry LACEY, a 24 year old Stockman from Wanaaring, New South Wales. He enlisted on 7 January 1916 with the 7th Light Horse Regiment, 17th Reinforcements. He subsequently Died of Wounds, 22 November 1917. 873 Private William George LAMBERTH, a 26 year old Farmer from Giddi Giddi via Goondiwindi, Queensland. He enlisted on 14 December 1914 with the 6th Light Horse Regiment, 4th Reinforcements. He subsequently Returned to Australia, 12 November 1917. 795 Private Richard LANCASTER, a 21 year old Drover from Bourke, New South Wales. He enlisted on 11 December 1914 with the 6th Light Horse Regiment, 3rd Reinforcements. He subsequently Returned to Australia, 30 August 1918. 1752 Private Donald Stewart LAPSCOMD, a 20 year old Stationhand from Sydney, New South Wales. He enlisted on 17 August 1915 with the 7th Light Horse Regiment, 13th Reinforcements. At the conclusion of the war, he Returned to Australia, 28 June 1919. 3362 Private Vincent LATUS, a 37 year old Labourer from Wagga, New South Wales. He enlisted on 24 March 1917 with the 6th Light Horse Regiment, 28th Reinforcements. At the conclusion of the war, he Returned to Australia, 28 June 1919 . 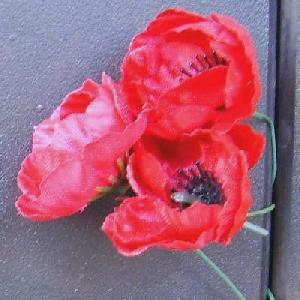 285 Private Andrew LAVENDER, a 34 year old Labourer from Bowen, New South Wales. He enlisted on 20 October 1914 with the 5th Light Horse Regiment, B Squadron. At the conclusion of the war, he Returned to Australia, 23 December 1918. 2880 Private Eric Beauchamp LAWSON, a 39 year old Clerk from Strathfield, New South Wales. He enlisted on 3 March 1916 with the 7th Light Horse Regiment, 20th Reinforcements. At the conclusion of the war, he Returned to Australia, 28 November 1919. 2884 Private George Adam LAWSON, a 21 year old Horse driver from Murwillumbah, New South Wales. He enlisted on 22 April 1916 with the 5th Light Horse Regiment, 20th Reinforcements. At the conclusion of the war, he Returned to Australia, 19 January 1919. 1061 Private William Innes LAWSON, a 32 year old Engineer from Sydney, New South Wales. He enlisted on 15 June 1915 with the 6th Light Horse Regiment, 6th Reinforcements. At the conclusion of the war, he Returned to Australia, 17 July 1919. 614 Private Maxwell David LEES, a 25 year old Bank Clerk from Goulburn, New South Wales. He enlisted on 10 December 1914 with the 6th Light Horse Regiment, 1st Reinforcements. At the conclusion of the war, he Returned to Australia, 26 December 1918. 173 Private Hurtle John LEWIS, a 30 year old Roo shooter from Wirrabara, South Australia. He enlisted on 21 September 1914 with the 5th Light Horse Regiment, Machine Gun Section. At the conclusion of the war, he Returned to Australia, 15 December 1918. 502 Private Charles Churchill LINTON, a 26 year old Stockman from Killara, New South Wales. He enlisted on 28 October 1914 with the 7th Light Horse Regiment, 16th Reinforcement. At the conclusion of the war, he Returned to Australia, 16 January 1919. 745 Private Justin F. LITTLE, a 28 year old Farmer from Sydney, New South Wales. He enlisted on 12 December 1914 with the 6th Light Horse Regiment, 2nd Reinforcements. He subsequently Returned to Australia, 28 December 1917. 2347 Private James Bathurst LIVET, a 21 year old Farrier from Darlinghurst, New South Wales. He enlisted on 15 November 1915 with the 6th Light Horse Regiment, 16th Reinforcements. At the conclusion of the war, he Returned to Australia, 28 January 1919. 668 Private Leonard Llewellyn LLOYD, a 31 year old Overseer from Bondi, New South Wales. He enlisted on 1 May 1915 with the 12th Light Horse Regiment, Machine Gun Section. He subsequently Returned to Australia, 12 November 1917. 107 Private Albert Robert LODDING, a 19 year old Wool contractor from Kalgoorlie, Western Australia. He enlisted on 23 May 1917 with the 1st Light Horse Machine Gun Squadron, 5th Reinforcements. At the conclusion of the war, he Returned to Australia, 28 June 1919. 2356 Private William LOUDON, a 23 year old Farmer from Fernside, New South Wales. He enlisted on 17 August 1915 with the 7th Light Horse Regiment, 16th Reinforcements. He subsequently Returned to Australia, 30 August 1918. 2056 Private Hubert George Lionel LOVELOCK, a 20 year old Stationhand from Junee, New South Wales. He enlisted on 3 September 1915 with the 7th Light Horse Regiment, 14th Reinforcements. At the conclusion of the war, he Returned to Australia, 5 March 1919. 1413 Private William James Hamilton LOWE, a 21 year old Farmer from Grudine, New South Wales. He enlisted on 14 August 1915 with the 12th Light Horse Regiment, 7th Reinforcements. He subsequently was Killed in Action, 28 August 1918. 2467 Private Norman Campbell LUCAS, a 28 year old Stockman from Ultimo, New South Wales. He enlisted on 9 December 1915 with the 6th Light Horse Regiment, 17th Reinforcements. At the conclusion of the war, he Returned to Australia, 5 March 1919. 1037 Private John LUDERS, a 24 year old Shearer from Nundle, New South Wales. He enlisted on 4 March 1915 with the 7th Light Horse Regiment, 6th Reinforcements. At the conclusion of the war, he Returned to Australia, 17 July 1919. 779 Private Angus Bernard MacDONALD, a 25 year old Drover from Longreach, Queensland. He enlisted on 21 December 1914 with the 5th Light Horse Regiment, 3rd Reinforcements. At the conclusion of the war, he Returned to Australia, 28 June 1919. 2933 Private Roy MacDONALD, a 21 year old Labourer from Central Tilba, New South Wales. He enlisted on 24 January 1916 with the 6th Light Horse Regiment, 21st Reinforcements. At the conclusion of the war, he Returned to Australia, 28 June 1919. 2876 Private Alexander Percival Thwaites MACK, a 33 year old Grazier from Pallah, New South Wales. He enlisted on 8 February 1916 with the 7th Light Horse Regiment, 20th Reinforcements. At the conclusion of the war, he Returned to Australia, 28 June 1919. 64079 Private Austin McDonnall MACK, a 19 year old Jackeroo from Bingara, New South Wales. He enlisted on 23 May 1918 with the 5th General Service Reinforcements, New South Wales . At the conclusion of the war, he Returned to Australia, 28 June 1919. 2886 Private Rawdon McDougall MACK, an 18 year old Grazier from Luton Hoo, New South Wales. He enlisted on 31 January 1916 with the 7th Light Horse Regiment, 20th Reinforcements. At the conclusion of the war, he Returned to Australia, 5 March 1919. 1627 Private Thomas Harrison MacKAY, a 27 year old Farmer from Warwick, Queensland. He enlisted on 14 October 1916 with the Imperial Camel Corps, 7th Reinforcements. At the conclusion of the war, he Returned to Australia, 28 June 1919. 2308 Private George Henry MacPHERSON, a 31 year old Labourer from Cloncurry, Queensland. He enlisted on 28 October 1915 with the 5th Light Horse Regiment, 16th Reinforcements. At the conclusion of the war, he Returned to Australia, 17 July 1919. 953 Private Harry MALCOLM, a 23 year old Clerk from Paddington, New South Wales. He enlisted on 30 December 1914 with the 6th Light Horse Regiment, 5th Reinforcements. At the conclusion of the war, he Returned to Australia, 28 June 1919. 1661 Private Leo Charles MARCH., an 18 year old Groom from Dowra, New South Wales. He enlisted on 1 September 1915 with the 7th Light Horse Regiment, 12th Reinforcements. At the conclusion of the war, he Returned to Australia, 28 June 1919. 3252 Private Samuel Thomas MARCUS, a 21 year old Farmer from Oaklands, New South Wales. He enlisted on 3 February 1917 with the 7th Light Horse Regiment, 26th Reinforcements. At the conclusion of the war, he Returned to Australia, 29 April 1919. 3576 Private Francis Paxton MARTIN, a 32 year old Station Manager from Barkers Creek via Castlemaine, Victoria. He enlisted on 17 August 1915 with the 13th Infantry Battalion, 11th Reinforcements. He subsequently Returned to Australia, 22 January 1917. 2821 Private John MARTIN, a 29 year old Carpenter from Sydney, New South Wales. He enlisted on 31 August 1915 with the 6th Light Horse Regiment, 19th Reinforcements. He subsequently Returned to Australia, 21 December 1918. 3545 Private Walter MARTIN, an 18 year old Engineer apprentice from Londonderry, New South Wales. He enlisted on 14 May 1917 with the 7th Light Horse Regiment, 31st Reinforcements. At the conclusion of the war, he Returned to Australia, 28 June 1919. 1792 Acting Corporal William MARTIN, a 43 year old Stockman from Arncliffe, New South Wales. He enlisted on 29 September 1915 with the 7th Light Horse Regiment, 12th Reinforcements. At the conclusion of the war, he Returned to Australia, 10 July 1919. 806 Private Darval Bertram Mervyn MARTYN, a 25 year old Clerk from Wee Waa, New South Wales. He enlisted on 24 March 1915 with the 12th Light Horse Regiment, 1st Reinforcements. At the conclusion of the war, he Returned to Australia, 6 May 1919. 802 Private Edward Rupert MAYES, a 21 year old Labourer from Manly, New South Wales. He enlisted on 11 December 1914 with the 6th Light Horse Regiment, 3rd Reinforcements. At the conclusion of the war, he Returned to Australia, 28 June 1919. 2475 Private Alexander Edward James McCABE, a 24 year old Shearer from Longreach, Queensland. He enlisted on 22 March 1916 with the 5th Light Horse Regiment, 17th Reinforcements. At the conclusion of the war, he Returned to Australia, 17 July 1919. 148 Private Francis John McCABE, a 23 year old Farmer from Spicers Creek via Wellington, New South Wales. He enlisted on 7 August 1914 with the 6th Light Horse Regiment, A Squadron. At the conclusion of the war, he Returned to Australia, 28 June 1919. 1099 Private Horace Edward McCABE, an 18 year old Station Manager from Spicers Creek via Wellington, New South Wales. He enlisted on 3 April 1915 with the 6th Light Horse Regiment, 7th Reinforcements. At the conclusion of the war, he Returned to Australia, 26 July 1919. 2480 Private Robert George McCAHON, a 32 year old Farmer from Boggabri, New South Wales. He enlisted on 20 January 1916 with the 7th Light Horse Regiment, 17th Reinforcements. At the conclusion of the war, he Returned to Australia, 23 December 1918. 57512 Private Raymond Price McCALLUM, a 19 year old Labourer from Millicent, South Australia. He enlisted on 3 January 1918 with the 4th General Service Reinforcements, South Australia . At the conclusion of the war, he Returned to Australia, 28 June 1919. 50 Shoeing Smith Eugene Prosper McCARTHY, a 30 year old Station hand from Meldrum via Armidale, New South Wales. He enlisted on 30 September 1914 with the 6th Light Horse Regiment, A Squadron. He subsequently Returned to Australia, 13 October 1918. 639 Private William McCARTHY, a 22 year old Labourer from Grahams Hill via Glencoe, New South Wales. He enlisted on 21 October 1914 with the 7th Light Horse Regiment, 1st Reinforcements. He subsequently was Killed in Action, 5 November 1917. 2358 Private Alexander Stuart McDONALD, a 21 year old Farmer from Lockwood via Canowindra, New South Wales. He enlisted on 21 August 1915 with the 6th Light Horse Regiment, 16th Reinforcements. At the conclusion of the war, he Returned to Australia, 28 June 1919. 2474 Private Jack McDONALD, a 19 year old Drover from Goombungee, Queensland. He enlisted on 27 September 1915 with the 5th Light Horse Regiment, 17th Reinforcements. At the conclusion of the war, he Returned to Australia, 16 March 1919. 108 Private John McGLINN, a 19 year old Railworker from York, Western Australia. He enlisted on 5 June 1917 with the 1st Light Horse Machine Gun Squadron, 5th Reinforcements. At the conclusion of the war, he Returned to Australia, 28 June 1919. 810 Private John Stafford McKENZIE, a 28 year old Works Overseer from Wee Waa, New South Wales. He enlisted on 24 March 1915 with the 12th Light Horse Regiment, 1st Reinforcements. At the conclusion of the war, he Returned to Australia, 6 May 1919. 732 Private John Thomas McNAMARA, a 24 year old Labourer / Wooldresser from Tottenham via Dandaloo, New South Wales. He enlisted on 5 December 1914 with the 6th Light Horse Regiment, 2nd Reinforcements. At the conclusion of the war, he Returned to Australia, 29 April 1919. 3627 Private Charles Phillip Clifton MEDBURY, a 19 year old Storeman from Woollahra, New South Wales. He enlisted on 16 April 1917 with the 6th Light Horse Regiment, 32nd Reinforcements. At the conclusion of the war, he Returned to Australia, 17 July 1919. 2469 Private Joseph MERNAGH, a 25 year old Seaman from Krambach via Wingham, New South Wales. He enlisted on 4 December 1915 with the 6th Light Horse Regiment, 17th Reinforcements. At the conclusion of the war, he Returned to Australia, 28 June 1919. 3065 Private Cecil George William MILLER, a 29 year old Farmer from St Marys, New South Wales. He enlisted on 21 November 1916 with the 6th Light Horse Regiment, 23rd Reinforcements. At the conclusion of the war, he Returned to Australia, 19 January 1919. 2473 Private James MILLER, a 24 year old Grazier from Tambo, Queensland. He enlisted on 16 September 1915 with the 5th Light Horse Regiment, 17th Reinforcements. At the conclusion of the war, he Returned to Australia, 16 March 1919. 534 Private Arthur Oswald MILNER, a 24 year old Labourer from Newtown, New South Wales. He enlisted on 2 November 1914 with the 7th Light Horse Regiment, C Squadron. He subsequently Returned to Australia, 28 December 1917. 2049 Private Herbert George MILTON, a 22 year old Labourer from New Market, Queensland. He enlisted on 23 September 1915 with the 5th Light Horse Regiment, 14th Reinforcements. At the conclusion of the war, he Returned to Australia, 4 March 1919. 2470 Private John Patrick MOLLOY, a 29 year old Driver from Strathfield, New South Wales. He enlisted on 3 January 1916 with the 6th Light Horse Regiment, 17th Reinforcements. At the conclusion of the war, he Returned to Australia, 5 February 1919. 2822 Private William Leslie MOLLOY, a 21 year old Shearer from Nundle via Tamworth, New South Wales. He enlisted on 27 January 1916 with the 6th Light Horse Regiment, 19th Reinforcements. At the conclusion of the war, he Returned to Australia, 1 August 1919. 2329 Private John Arthur MORISON, a 22 year old Labourer / Farmer from Condong, New South Wales. He enlisted on 29 April 1916 with the 5th Light Horse Regiment, 16th Reinforcements. At the conclusion of the war, he Returned to Australia, 28 June 1919. 1558 Private William Robert MORRIS, a 27 year old Labourer from Westdale via Tamworth, New South Wales. He enlisted on 7 September 1915 with the 6th Light Horse Regiment, 12th Reinforcements. He subsequently Returned to Australia, 12 November 1917. 69 Private Frank MORTON, a 23 year old Farm labourer from Collengullie, New South Wales. He enlisted on 5 October 1914 with the 7th Light Horse Regiment, Machine Gun Section. At the conclusion of the war, he Returned to Australia, 15 November 1918. 10 Private Albert Stanley MUIR, a 21 year old Teacher from Esk, Queensland. He enlisted on 15 September 1914 with the 5th Light Horse Regiment, Machine Gun Section. He subsequently was Killed in Action, 5 November 1917. 2824 Private James Archibald MUIR, a 25 year old Labourer from Queanbeyan, New South Wales. He enlisted on 19 January 1916 with the 7th Light Horse Regiment, 19th Reinforcements. At the conclusion of the war, he Returned to Australia, 16 March 1919. 1255 Private Henry MUIRHEAD, a 21 year old Farmer from Mosman, New South Wales. He enlisted on 7 June 1915 with the 5th Light Horse Regiment, 9th Reinforcements. At the conclusion of the war, he Returned to Australia, 27 March 1920. 640 Private Edward MULHOLLAND, a 25 year old Rail Shunter from Newcastle, New South Wales. He enlisted on 1 October 1914 with the 6th Light Horse Regiment, B Squadron. At the conclusion of the war, he Returned to Australia, 15 November 1918. 2213 Private Harold john MUNDON, an 18 year old Labourer from Proserpine, Queensland. He enlisted on 28 October 1915 with the 5th Light Horse Regiment, 15th Reinforcements. At the conclusion of the war, he Returned to Australia, 28 January 1919. 2651 Private John MUNRO, a 19 year old Labourer from Emerald, Queensland. He enlisted on 10 January 1916 with the 5th Light Horse Regiment, 18th Reinforcements. At the conclusion of the war, he Returned to Australia, 28 June 1919. 2652 Private William MUNRO, a 28 year old Labourer from Emerald, Queensland. He enlisted on 10 January 1916 with the 5th Light Horse Regiment, 18th Reinforcements. At the conclusion of the war, he Returned to Australia, 18 July 1919. 2409 Private Harrie Linden MURPHY, a 26 year old Bank clerk from Bombala, New South Wales. He enlisted on 30 December 1915 with the 7th Light Horse Regiment, 16th Reinforcements. He subsequently was Killed in Action, 28 August 1918. 729 Private John Joseph MURPHY, a 26 year old Bootmaker from Beaudesert, Queensland. He enlisted on 14 December 1914 with the 5th Light Horse Regiment, 2nd Reinforcements. He subsequently Returned to Australia, 22 January 1917. 2818 Private William Coulson MURPHY, a 20 year old Farmer from Bullaring siding via Narrogin, Western Australia. He enlisted on 6 November 1916 with the Imperial Camel Corps, 10th Reinforcements. At the conclusion of the war, he Returned to Australia, 28 June 1919. 437 Private Arthur MURRAY, a 22 year old Ironworker from Darlington, New South Wales. He enlisted on 16 September 1914 with the 6th Light Horse Regiment, C Squadron. He subsequently Returned to Australia, 13 October 1918. 1426 Private Bertram Herman Billet NAVEAU, a 22 year old Electrician from Queenbeyan, New South Wales. He enlisted on 27 August 1915 with the 12th Light Horse Regiment, 7th Reinforcements. At the conclusion of the war, he Returned to Australia, 28 June 1919. 2823 Private Albert William NEWPORT, a 33 year old Cleaner from Sydney, New South Wales. He enlisted on 3 December 1915 with the 6th Light Horse Regiment, 19th Reinforcements. At the conclusion of the war, he Returned to Australia, 28 June 1919. 1093 Private William Henry NEWTON, a 23 year old Labourer from Brisbane, Queensland. He enlisted on 17 February 1915 with the 5th Light Horse Regiment, 7th Reinforcements. At the conclusion of the war, he Returned to Australia, 29 April 1919. 1115 Private Archibald NICOL, a 19 year old Drover from Kangaroo Pt, Queensland. He enlisted on 17 February 1915 with the 5th Light Horse Regiment, 7th Reinforcements. At the conclusion of the war, he Returned to Australia, 17 July 1916. 905 Private Thomas NIELSEN, a 23 year old Carpenter from Townsville, Queensland. He enlisted on 24 December 1914 with the 5th Light Horse Regiment, 4th Reinforcements. At the conclusion of the war, he Returned to Australia, 28 June 1919. 673 Private Frank William NIVISON, a 31 year old Grazier from Ohio station, New South Wales. He enlisted on 21 April 1915 with the 12th Light Horse Regiment, Machine Gun Section. At the conclusion of the war, he Returned to Australia, 16 May 1919. 883 Private Andrew NORMAN, a 24 year old Labourer from Mincham, Queensland. He enlisted on 28 December 1914 with the 5th Light Horse Regiment, 4th Reinforcements. At the conclusion of the war, he Returned to Australia, 28 June 1919. 2472 Private Ernest John NORTON, a 19 year old Farmer from Enfield, New South Wales. He enlisted on 2 November 1915 with the 5th Light Horse Regiment, 17th Reinforcements. He subsequently was Killed in Action, 19 April 1917. 2293 Private Francis Edward OAKES, a 29 year old Horsebreaker from Muswellbrook, New South Wales. He enlisted on 2 November 1915 with the 7th Light Horse Regiment, 15th Reinforcements. At the conclusion of the war, he Returned to Australia, 28 June 1919. 3559 Private John OBRIEN, a 24 year old Labourer from Paddington, New South Wales. He enlisted on 8 June 1917 with the 6th Light Horse Regiment, 31st Reinforcements. At the conclusion of the war, he Returned to Australia, 19 August 1919. 1260 Private Stephen ODONNELL, a 25 year old Labourer from Silver Grove, Queensland. He enlisted on 29 May 1915 with the 5th Light Horse Regiment, 9th Reinforcements. At the conclusion of the war, he Returned to Australia, 28 June 1919. 602 Private John OGLE, a 21 year old Labourer from Tamworth, New South Wales. He enlisted on 19 November 1914 with the 7th Light Horse Regiment, 1st Reinforcements. At the conclusion of the war, he Returned to Australia, 15 November 1918. 51 Private Denis OHARA, a 21 year old Labourer from Ayr, Queensland. He enlisted on 17 September 1914 with the 5th Light Horse Regiment, Machine Gun Section. At the conclusion of the war, he Returned to Australia, 15 May 1919. 415 Private Michael John OKEEFE, a 20 year old Labourer from Cootamundra, New South Wales. He enlisted on 29 October 1914 with the 7th Light Horse Regiment, B Squadron. At the conclusion of the war, he Returned to Australia, 15 November 1918. 2654 Private Charles Gustav OLSEN, a 29 year old Labourer from Maryborough, Queensland. He enlisted on 24 January 1916 with the 5th Light Horse Regiment, 18th Reinforcements. At the conclusion of the war, he Returned to Australia, 28 June 1919. 604 Private Harold Reath OLVER, a 24 year old Station Overseer from Chatswood, New South Wales. He enlisted on 21 November 1914 with the 6th Light Horse Regiment, A Squadron. He subsequently was Killed in Action, 4 August 1916. 3305 Private Frank OROURKE, a 29 year old Barman from Surry Hills, New South Wales. He enlisted on 27 February 1917 with the 6th Light Horse Regiment, 27th Reinforcements. At the conclusion of the war, he Returned to Australia, 28 June 1919. 2373 Private Leonard Ernest OWEN, a 21 year old Liftman from Leichhardt, New South Wales. He enlisted on 20 September 1915 with the 7th Light Horse Regiment, 16th Reinforcements. At the conclusion of the war, he Returned to Australia, 28 June 1919. 606 Private Robert Gregory OWEN-JONES, a 23 year old Dairyman from Redlands, New South Wales. He enlisted on 11 November 1914 with the 5th Light Horse Regiment, Machine Gun Section. At the conclusion of the war, he Returned to Australia, 15 November 1918. 881 Private Ernest OWENS, a 24 year old Labourer from Sydney, New South Wales. He enlisted on 9 December 1914 with the 6th Light Horse Regiment, 4th Reinforcements. At the conclusion of the war, he Returned to Australia, 2 January 1919. 1780 Private Percy John PADDISON, a 21 year old Labourer from Baldry via Wellington, New South Wales. He enlisted on 30 August 1915 with the 7th Light Horse Regiment, 13th Reinforcements. At the conclusion of the war, he Returned to Australia, 17 June 1919. 50351 Private Alexander PAKES, a 39 year old Greengrocer from Mascot, New South Wales. He enlisted on 28 January 1918 with the 1st General Service Reinforcements, New South Wales . At the conclusion of the war, he Returned to Australia, 27 June 1919. 50351 Private Alexander PAKES, a 39 year old Grocer from Mascot, New South Wales. He enlisted on 28 January 1918 with the 1st General Service Reinforcements, New South Wales . At the conclusion of the war, he Returned to Australia, 27 June 1919. 2656 Private John Hilton PARKER, a 26 year old Drover from Alexandria, New South Wales. He enlisted on 31 January 1916 with the 6th Light Horse Regiment, 18th Reinforcements. At the conclusion of the war, he Returned to Australia, 29 August 1919. 1730 Private John PARRETT, a 22 year old Labourer from Nth Devon, Victoria. He enlisted on 20 January 1916 with the 12th Light Horse Regiment, 8th Reinforcements. At the conclusion of the war, he Returned to Australia, 28 June 1919. 1038 Private Robert Henry PASLEY, a 20 year old Timberman from Tumoulin, Queensland. He enlisted on 11 January 1915 with the 5th Light Horse Regiment, 6th Reinforcements. At the conclusion of the war, he Returned to Australia, 28 June 1919. 515 Private Harold John PATERSON, a 24 year old Engineer from Cootamundra, New South Wales. He enlisted on 13 January 1915 with the 12th Light Horse Regiment, Machine Gun Section. At the conclusion of the war, he Returned to Australia, 29 April 1919. 2657 Private Walter PATTERSON, a 22 year old Blacksmith from Stanmore, New South Wales. He enlisted on 9 December 1915 with the 6th Light Horse Regiment, 18th Reinforcements. At the conclusion of the war, he Returned to Australia, 28 June 1919. 2346 Private Harry PEARCE, a 37 year old Storekeeper from Winton, Queensland. He enlisted on 27 December 1915 with the 5th Light Horse Regiment, 16th Reinforcements. At the conclusion of the war, he Returned to Australia, 28 June 1919. 3427 Private George Edgar PEGG, a 25 year old Farmer from Moorooka, Queensland. He enlisted on 14 May 1917 with the 5th Light Horse Regiment, 29th Reinforcements. At the conclusion of the war, he Returned to Australia, 5 March 1919. 2416 Private Charles PENO, an 18 year old Stockman from Baan Baa, New South Wales. He enlisted on 19 January 1916 with the 5th Light Horse Regiment, 16th Reinforcements. At the conclusion of the war, he Returned to Australia, 2 August 1919. 655 Private William Victor PENROSE, a 23 year old Labourer from Moonee Ponds, Victoria. He enlisted on 27 September 1914 with the 6th Light Horse Regiment, 1st Reinforcements. At the conclusion of the war, he Returned to Australia, 28 June 1919. 446 Private Charles Ernest PERROTTET, a 22 year old Grazier from Trangie, New South Wales. He enlisted on 16 September 1914 with the 6th Light Horse Regiment, C Squadron. At the conclusion of the war, he Returned to Australia, 15 November 1918. 1048 Private John Delaney PETTITT, a 21 year old Labourer from Yanko, New South Wales. He enlisted on 27 January 1915 with the 7th Light Horse Regiment, 6th Reinforcements. At the conclusion of the war, he Returned to Australia, 28 June 1919. 3361 Private Edmund Henry Haldon PHILP, an 18 year old Grazier from Drayton, Queensland. He enlisted on 8 February 1917 with the 5th Light Horse Regiment, 28th Reinforcements. At the conclusion of the war, he Returned to Australia, 28 June 1919. 52656 Private Henry Edwin PIDCOCK, a 22 year old Cattledealer from Tatham, New South Wales. He enlisted on 15 May 1918 with the 2nd General Service Reinforcements, Queensland . At the conclusion of the war, he Returned to Australia, 28 June 1919. 2657 Private William Joseph POINTON, a 19 year old Bullock driver from Kilcoy, Queensland. He enlisted on 5 November 1915 with the 5th Light Horse Regiment, 18th Reinforcements. At the conclusion of the war, he Returned to Australia, 28 June 1919. 3428 Private Arthur POLLITT, an 18 year old Stockman from Gympie, Queensland. He enlisted on 4 July 1916 with the 5th Light Horse Regiment, 29th Reinforcements. At the conclusion of the war, he Returned to Australia, 16 April 1919. 1707 Private Duncan James POOLE, a 22 year old Farmer from Hazted, New South Wales. He enlisted on 30 August 1915 with the 7th Light Horse Regiment, 11th Reinforcements. At the conclusion of the war, he Returned to Australia, 1 November 1919. 345 Private Ralph POOLE, a 19 year old Labourer from The Rock, New South Wales. He enlisted on 1 October 1914 with the 7th Light Horse Regiment, B Squadron. He subsequently Died of Wounds, 20 November 1917. 2478 Private Reuben Joseph POXON, a 21 year old Labourer from Toowoomba, Queensland. He enlisted on 30 September 1915 with the 5th Light Horse Regiment, 17th Reinforcements. At the conclusion of the war, he Returned to Australia, 28 June 1919. 2487 Private Harold Douglas PRICE, a 23 year old Clerk from Woollahra, New South Wales. He enlisted on 10 January 1916 with the 7th Light Horse Regiment, 17th Reinforcements. At the conclusion of the war, he Returned to Australia, 17 July 1919. 2230 Private James William PRINCE, an 18 year old Farmer from Appletree flat Mudgee, New South Wales. He enlisted on 28 August 1915 with the 7th Light Horse Regiment, 15th Reinforcements. At the conclusion of the war, he Returned to Australia, 28 June 1919. 2380 Private Ronald Reeves PRYOR, an 18 year old Labourer from Coramba, New South Wales. He enlisted on 16 November 1915 with the 7th Light Horse Regiment, 16th Reinforcements. At the conclusion of the war, he Returned to Australia, 28 June 1919. 1434 Private Norman PYE, a 24 year old Blacksmith from Burwood, New South Wales. He enlisted on 19 August 1915 with the 12th Light Horse Regiment, 7th Reinforcements. At the conclusion of the war, he Returned to Australia, 28 June 1919. 67 Driver Roy REDMAN, a 23 year old Labourer from Sydney, New South Wales. He enlisted on 17 September 1914 with the 5th Light Horse Regiment, Machine Gun Section. At the conclusion of the war, he Returned to Australia, 22 November 1918. 3495 Private Thomas REDMAN, a 28 year old Labourer from Rozelle, New South Wales. He enlisted on 6 June 1917 with the 6th Light Horse Regiment, 30th Reinforcements. At the conclusion of the war, he Returned to Australia, 28 June 1919 . 549 Private Clement REID, a 22 year old Stockman from Coney Creek via Wanehope, New South Wales. He enlisted on 4 November 1914 with the 7th Light Horse Regiment, C Squadron. At the conclusion of the war, he Returned to Australia, 15 November 1918. 496 Driver Arthur Vincent REIN, a 25 year old Rail fireman from Redfern, Victoria. He enlisted on 1 October 1914 with the 6th Light Horse Regiment, Machine Gun Section. He subsequently Returned to Australia, 28 December 1917. 2218 Private Alfred Paul RICHARDS, a 22 year old Fireman from Marrickville, New South Wales. He enlisted on 10 August 1915 with the 6th Light Horse Regiment, 15th Reinforcements. At the conclusion of the war, he Returned to Australia, 29 April 1919. 886 Private Douglas Gordon RICHMOND, a 21 year old Farmer from Haberfield, New South Wales. He enlisted on 21 December 1914 with the 6th Light Horse Regiment, 4th Reinforcements. At the conclusion of the war, he Returned to Australia, 28 June 1919. 3190 Private John Seeley RITCHIE, a 24 year old Grazier from Pilatus, New South Wales. He enlisted on 22 January 1917 with the 6th Light Horse Regiment, 25th Reinforcements. At the conclusion of the war, he Returned to Australia, 28 June 1919. 67 Sergeant William Arthur ROBBINS, a 26 year old Groom from Tatura, Victoria. He enlisted on 2 October 1914 with the 7th Light Horse Regiment, Machine Gun Section. At the conclusion of the war, he Returned to Australia, 15 November 1918. 3188 Private Robert Hall ROBINSON, a 37 year old Farmer from Nanango, Queensland. He enlisted on 10 May 1916 with the 5th Light Horse Regiment, 25th Reinforcements. At the conclusion of the war, he Returned to Australia, 2 January 1919. 1441 Private Arthur Walker ROGER, a 26 year old Grocer from Goulburn, New South Wales. He enlisted on 15 August 1915 with the 12th Light Horse Regiment, 7th Reinforcements. At the conclusion of the war, he Returned to Australia, 9 July 1919. 742 Private Frederick ROGERS, a 21 year old Labourer from Bega via Candelo, New South Wales. He enlisted on 8 December 1914 with the 7th Light Horse Regiment, 2nd Reinforcements. At the conclusion of the war, he Returned to Australia, 28 June 1919. 2488 Private George Cameron ROPER, a 26 year old Grazier from Karara via Warwick, Queensland. He enlisted on 20 January 1916 with the 7th Light Horse Regiment, 17th Reinforcements. He subsequently Returned to Australia, 30 August 1918. 2231 Private Joseph James ROSS, a 20 year old Motor driver from Prairie, Queensland. He enlisted on 28 October 1915 with the 5th Light Horse Regiment, 15th Reinforcements. He subsequently Returned to Australia, 2 September 1916. 816 Private Wallace Livingstone ROUSE, a 20 year old Stationhand from Goodooga, New South Wales. He enlisted on 19 November 1914 with the 6th Light Horse Regiment, 3rd Reinforcements. At the conclusion of the war, he Returned to Australia, 28 June 1919. 1053 Private William Molyneaux ROYDS, a 32 year old Grazier from Durham Hall, New South Wales. He enlisted on 4 April 1915 with the 7th Light Horse Regiment, 6th Reinforcements. He subsequently Returned to Australia, 27 October 1917. 3429 Private William RUSSELL, a 24 year old Labourer from Gympie, Queensland. He enlisted on 4 June 1917 with the 5th Light Horse Regiment, 29th Reinforcements. At the conclusion of the war, he Returned to Australia, 28 June 1919. 2890 Private Cornelius James RYAN, a 21 year old Stockman from Bundaberg, Queensland. He enlisted on 21 March 1916 with the 5th Light Horse Regiment, 20th Reinforcements. He subsequently Died of Wounds, 4 May 1918. 2658 Private James RYAN, a 22 year old Labourer from Lismore, New South Wales. He enlisted on 3 January 1916 with the 5th Light Horse Regiment, 18th Reinforcements. At the conclusion of the war, he Returned to Australia, 16 March 1919. 57262 Private Patrick RYAN, a 19 year old Mechanical fitter from Brisbane, Queensland. He enlisted on 27 May 1918 with the 4th General Service Reinforcements, Queensland . At the conclusion of the war, he Returned to Australia, 28 June 1919. 745 Private Herbert Edward SAMUELS, a 34 year old Labourer from Hay, New South Wales. He enlisted on 8 December 1914 with the 7th Light Horse Regiment, 2nd Reinforcements. He subsequently was Killed in Action, 9 August 1916. 2660 Private Joseph Henry John SAUNDERS, a 25 year old Farmer from Dowan via Mt Morgan, Queensland. He enlisted on 19 January 1916 with the 5th Light Horse Regiment, 18th Reinforcements. At the conclusion of the war, he Returned to Australia, 22 August 1919. 971 Private Arthur Rodney SAUNDERSON, a 21 year old Stockman from Brisbane, Queensland. He enlisted on 23 December 1914 with the 5th Light Horse Regiment, 5th Reinforcements. At the conclusion of the war, he Returned to Australia, 17 June 1920. 3431 Private Cecil John SAYLE, a 25 year old Storeman from Stanmore, New South Wales. He enlisted on 16 April 1917 with the 7th Light Horse Regiment, 29th Reinforcements. At the conclusion of the war, he Returned to Australia, 17 July 1919. 522 Private Cecil Stanley SCOTT, a 21 year old Farmer from Lockhart, New South Wales. He enlisted on 14 November 1914 with the 6th Light Horse Regiment, A Squadron. He subsequently Died of Disease, 25 November 1918. 2827 Private John SCOTT, a 30 year old Farmer from Lindfield, New South Wales. He enlisted on 20 November 1915 with the 6th Light Horse Regiment, 19th Reinforcements. At the conclusion of the war, he Returned to Australia, 25 November 1919. 1723 Private George John SHARP, a 20 year old Labourer from Portland, New South Wales. He enlisted on 18 January 1916 with the 12th Light Horse Regiment, 8th Reinforcements. At the conclusion of the war, he Returned to Australia, 28 June 1919. 3704 Private Jack SHARP, an 18 year old Clerk from Rockdale, New South Wales. He enlisted on 5 November 1917 with the Imperial Camel Corps, 14th Reinforcements. At the conclusion of the war, he Returned to Australia, 28 June 1919. 1187 Private Charles Hamilton Wardell SHEDDEN, a 23 year old Station Overseer from Sydney, New South Wales. He enlisted on 26 April 1915 with the 6th Light Horse Regiment, 8th Reinforcements. At the conclusion of the war, he Returned to Australia, 9 December 1919. 3012 Private James John Woods SINNOTT, a 30 year old Stationer from Rockhampton, Queensland. He enlisted on 14 February 1916 with the 5th Light Horse Regiment, 22nd Reinforcements. At the conclusion of the war, he Returned to Australia, 28 January 1919. 2237 Private Thomas SMELTZER, a 19 year old Drover from Paddington, Queensland. He enlisted on 22 October 1915 with the 5th Light Horse Regiment, 15th Reinforcements. At the conclusion of the war, he Returned to Australia, 5 March 1919. 2892 Private Arthur Glover SMITH, a 25 year old Station Manager from Bourke, New South Wales. He enlisted on 8 February 1916 with the 6th Light Horse Regiment, 20th Reinforcements. At the conclusion of the war, he Returned to Australia, 15 November 1918. 62 Private James Bernard SMITH, a 21 year old Labourer from Nyngan, New South Wales. He enlisted on 30 September 1914 with the 7th Light Horse Regiment, Machine Gun Section. At the conclusion of the war, he Returned to Australia, 25 December 1918. 3615 Private James Charles SMITH, an 18 year old Printer from Kurri Kurri, New South Wales. He enlisted on 10 May 1917 with the 7th Light Horse Regiment, 32nd Reinforcements. At the conclusion of the war, he Returned to Australia, 28 June 1919. 1045 Private John Henry SMITH, a 19 year old Boundryrider from Brisbane, Queensland. He enlisted on 18 January 1915 with the 5th Light Horse Regiment, 6th Reinforcements. At the conclusion of the war, he Returned to Australia, 9 July 1919. 519 Private Lionel Thomas Watson SMITH, a 27 year old Bank Clerk from Wellington, New South Wales. He enlisted on 23 January 1915 with the 12th Light Horse Regiment, C Squadron. He subsequently was Killed in Action, 5 August 1916. 3610 Private Walter Charles SPARROW, a 19 year old Mechanic from Petersham, New South Wales. He enlisted on 7 June 1917 with the 6th Light Horse Regiment, 32nd Reinforcements. At the conclusion of the war, he Returned to Australia, 28 June 1919. 3257 Private Leslie James Eustace SPENCE, an 18 year old Postalworker from Mosman, New South Wales. He enlisted on 22 February 1917 with the 7th Light Horse Regiment, 26th Reinforcements. At the conclusion of the war, he Returned to Australia, 14 March 1919. 812 Private Edward Lewis SPIKE, a 24 year old Windmill expert from Malvern via Cloncurry, Queensland. He enlisted on 11 May 1915 with the 12th Light Horse Regiment, 1st Reinforcements. At the conclusion of the war, he Returned to Australia, 3 May 1919. 1515 Private Charles Joseph SPILLANE, a 21 year old Labourer from Albion Park, New South Wales. He enlisted on 1 November 1915 with the 6th Light Horse Regiment, 11th Reinforcements. At the conclusion of the war, he Returned to Australia, 28 June 1919. 1347 Private Gordon Fulton SPILLSBURY, a 24 year old Drover from Devonport, Tasmania. He enlisted on 5 June 1915 with the 5th Light Horse Regiment, 10th Reinforcements. At the conclusion of the war, he Returned to Australia, 9 July 1919. 1768 Private John Oliver SPROULE, an 18 year old Farmer from Woodbrook, New South Wales. He enlisted on 13 September 1915 with the 7th Light Horse Regiment, 12th Reinforcements. At the conclusion of the war, he Returned to Australia, 6 July 1919. 675 Private Francis Bede STAFFORD, a 26 year old Motordriver from Woolwich, New South Wales. He enlisted on 23 December 1914 with the 12th Light Horse Regiment, Machine Gun Section. At the conclusion of the war, he Returned to Australia, 28 June 1919. 2380 Private Richard STARR, a 24 year old Farmer from Copper Hill, New South Wales. He enlisted on 25 August 1915 with the 6th Light Horse Regiment, 16th Reinforcements. At the conclusion of the war, he Returned to Australia, 28 June 1919. 2226 Private Percy Gordon STEINMETZ, a 31 year old Sawmill Manager from Taree, New South Wales. He enlisted on 24 November 1915 with the 6th Light Horse Regiment, 15th Reinforcements. At the conclusion of the war, he Returned to Australia, 28 June 1919. 57459 Private William John STEPHENS, an 18 year old Farmlabourer from Drouin, Victoria. He enlisted on 23 April 1918 with the 4th General Service Reinforcements, Victoria . At the conclusion of the war, he Returned to Australia, 28 June 1919. 2227 Private Edward Joseph STEVENSON, a 27 year old Clerk from Cecil Park Liverpool, New South Wales. He enlisted on 15 November 1915 with the 6th Light Horse Regiment, 15th Reinforcements. At the conclusion of the war, he Returned to Australia, 28 June 1919. 442 Private Joseph STONE, a 25 year old Butcher from Sydney, New South Wales. He enlisted on 18 November 1914 with the 7th Light Horse Regiment, B Squadron. He subsequently Returned to Australia, 15 February 1918. 501 Private Sydney STOUT, a 22 year old Labourer from Sydney, New South Wales. He enlisted on 18 September 1914 with the 6th Light Horse Regiment, Machine Gun Section. He subsequently Returned to Australia, 20 October 1918. 1114 Private William James Lumsden STRANGE-MURE, a 20 year old Carpenter from Randwick, New South Wales. He enlisted on 10 April 1915 with the 7th Light Horse Regiment, 7th Reinforcements. He subsequently Returned to Australia, 15 February 1918. 2936 Private David SUTHERLAND, a 26 year old Station Manager from Arncliffe, New South Wales. He enlisted on 30 January 1916 with the 6th Light Horse Regiment, 21st Reinforcements. At the conclusion of the war, he Returned to Australia, 23 December 1918. 2657 Private Henry Richard TANNER, a 24 year old Labourer from Waverley, New South Wales. He enlisted on 4 January 1916 with the 7th Light Horse Regiment, 18th Reinforcements. He subsequently Returned to Australia, 11 July 1917. 61 Private Charles Edward TAYLOR, a 25 year old Labourer from Flynns Creek, Victoria. He enlisted on 23 September 1914 with the 5th Light Horse Regiment, Machine Gun Section. At the conclusion of the war, he Returned to Australia, 15 January 1919. 2893 Private Robert TEMPLETON, a 20 year old Labourer from Palmer Channel, Queensland. He enlisted on 27 April 1916 with the 5th Light Horse Regiment, 20th Reinforcements. At the conclusion of the war, he Returned to Australia, 28 June 1919. 3528 Private Claude THOMPSON, a 24 year old Labourer from Balmain, New South Wales. He enlisted on 22 May 1917 with the Imperial Camel Corps, 13th Reinforcements. At the conclusion of the war, he Returned to Australia, 28 June 1919. 647 Private Frederick THORNTON, a 19 year old Timbercutter from Kilcoy, Queensland. He enlisted on 17 November 1914 with the 5th Light Horse Regiment, 1st Reinforcements. At the conclusion of the war, he Returned to Australia, 15 November 1918. 50364 Private Martin James TICEHURST, a 31 year old Carrier from Forbes, New South Wales. He enlisted on 21 January 1918 with the 1st General Service Reinforcements, New South Wales . At the conclusion of the war, he Returned to Australia, 28 June 1919. 2832 Private Arthur John TROLLOPE, a 34 year old Clerk from Wollstonecraft, New South Wales. He enlisted on 3 January 1916 with the 6th Light Horse Regiment, 19th Reinforcements. At the conclusion of the war, he Returned to Australia, 15 March 1919. 320 Private Norman Alexander TUCKWELL, a 20 29 year old Grocer / Rough rider from Woonona via Bulli, New South Wales / Forbes, New South Wales. He enlisted on 23 September 1914 with the 7th Light Horse Regiment, B Squadron. He subsequently Returned to Australia, 30 August 1918. 57515 Private Charles Selbourne TURNER, an 18 year old Stationhand from Adelaide, South Australia. He enlisted on 11 May 1918 with the 4th General Service Reinforcements, South Australia . At the conclusion of the war, he Returned to Australia, 28 June 1919. 3793 Private William UNDERWOOD, a 20 year old Teacher from Nowra, New South Wales. He enlisted on 20 December 1916 with the 7th Light Horse Regiment, 35th Reinforcements. At the conclusion of the war, he Returned to Australia, 28 June 1919. 739 Private Cecil John UPTON, a 20 year old Dairy Farmer from Newtown, New South Wales. He enlisted on 27 November 1915 with the 6th Light Horse Regiment, 2nd Reinforcements. At the conclusion of the war, he Returned to Australia, 5 March 1919. 2882 Private Edward Stanley URE-SMITH, a 27 year old Station Overseer from Hotel Australia Sydney, New South Wales. He enlisted on 11 March 1916 with the 7th Light Horse Regiment, 20th Reinforcements. At the conclusion of the war, he Returned to Australia, 26 January 1919. 5154 Private John URE-SMITH, a 24 year old Woolclasser from Hotel Australia Sydney, New South Wales. He enlisted on 25 January 1915 with the 3rd Light Horse Brigade Headquarters, 12th Company Australian Army Supply Corps. At the conclusion of the war, he Returned to Australia, 21 November 1919. 85 Private Herbert VINNICOMBE, a 23 year old Farmer from Sydney, New South Wales. He enlisted on 30 November 1914 with the 7th Light Horse Regiment, Machine Gun Section. At the conclusion of the war, he Returned to Australia, 8 May 1919. 1046 Private William Robert VOWLES, a 27 year old Grocer from Cunnamulla, Queensland. He enlisted on 17 January 1915 with the 5th Light Horse Regiment, 6th Reinforcements. He subsequently Returned to Australia, 8 March 1917. 3016 Private Edward WADE, a 25 year old Miner from Rockhampton, Queensland. He enlisted on 2 February 1916 with the 5th Light Horse Regiment, 22nd Reinforcements. At the conclusion of the war, he Returned to Australia, 27 June 1919. 2896 Private Berner Nugent Theo WALSH, a 27 year old Grazier from Murrays Creek, Queensland. He enlisted on 3 April 1916 with the 5th Light Horse Regiment, 20th Reinforcements. At the conclusion of the war, he Returned to Australia, 27 June 1919. 1421 Private Bruce Leon Clive WARD, a 19 year old Engineers Apprentice from Gosford, New South Wales. He enlisted on 6 July 1915 with the 7th Light Horse Regiment, 11th Reinforcements. He subsequently Returned to Australia, 12 November 1917. 2926 Acting Sergeant Edward Joseph WARD, a 24 year old Sorter PO from Charleville, Queensland. He enlisted on 25 September 1915 with the 5th Light Horse Regiment, 21st Reinforcements. At the conclusion of the war, he Returned to Australia, 9 July 1919. 902 Private Rowland Sydney WATERHOUSE, a 21 year old Coffee Planter from Palm Glen Norfolk Island. He enlisted on 25 January 1915 with the 7th Light Horse Regiment, 4th Reinforcements. At the conclusion of the war, he Returned to Australia, 16 March 1919. 579 Shoeing Smith Arthur WATSON, a 20 year old Blacksmith from Rainbow, Victoria. He enlisted on 23 November 1914 with the 7th Light Horse Regiment, C Squadron. At the conclusion of the war, he Returned to Australia, 15 November 1918 . 2481 Private Duncan WATSON, a 25 year old Labourer from Sarina, Queensland. He enlisted on 6 December 1915 with the 5th Light Horse Regiment, 17th Reinforcements. At the conclusion of the war, he Returned to Australia, 16 March 1919. 57268 Private Percival Frederick WATSON, an 18 year old Grocer from Clayfield, Queensland. He enlisted on 31 December 1917 with the 4th General Service Reinforcements, Queensland . At the conclusion of the war, he Returned to Australia, 28 June 1919. 78 Private William Henry WATSON, a 24 year old Electrical engineer from Emmaville, New South Wales. He enlisted on 14 October 1914 with the 7th Light Horse Regiment, Machine Gun Section. At the conclusion of the war, he Returned to Australia, 12 December 1918. 678 Private Alfred Lionel WAUCH, a 30 year old Gentleman from Strathfield, New South Wales. He enlisted on 21 April 1915 with the 12th Light Horse Regiment, Machine Gun Section. He subsequently Returned to Australia, 7 September 1916. 3564 Private John Louis WEDDERBURN, a 19 year old Scalemaker from Drummoyne, New South Wales. He enlisted on 11 June 1917 with the 7th Light Horse Regiment, 31st Reinforcements. At the conclusion of the war, he Returned to Australia, 28 June 1919. 2938 Private Frederick Albert WEIR, a 27 year old Dairyfarmer from Wesley Park via Kiama, New South Wales. He enlisted on 15 January 1916 with the 6th Light Horse Regiment, 21st Reinforcements. At the conclusion of the war, he Returned to Australia, 28 June 1919. 679 Private Colin Stanley WELLS, a 25 year old Boundryrider from Milsons Pt, New South Wales. He enlisted on 22 March 1915 with the 12th Light Horse Regiment, Machine Gun Section. At the conclusion of the war, he Returned to Australia, 6 July 1919. 503 Private Arthur Edward WESSELL, a 25 year old Labourer from Enmore, New South Wales. He enlisted on 12 October 1914 with the 7th Light Horse Regiment, C Squadron. At the conclusion of the war, he Returned to Australia, 15 November 1918. 2478 Private Harold John Arthur WEST, a 23 year old Orchardist from Canobolas via Orange, New South Wales. He enlisted on 25 November 1915 with the 6th Light Horse Regiment, 17th Reinforcements. At the conclusion of the war, he Returned to Australia, 28 June 1919. 3018 Private William WEST, a 26 year old Labourer from Rockhampton, Queensland. He enlisted on 21 February 1916 with the 5th Light Horse Regiment, 22nd Reinforcements. At the conclusion of the war, he Returned to Australia, 9 July 1919. 57035 Private Asher Ebenezer WESTCOTT, a 34 year old Storeman from Chatswood, New South Wales. He enlisted on 7 January 1918 with the 3rd General Service Reinforcements, New South Wales . At the conclusion of the war, he Returned to Australia, 29 April 1919. 2888 Private Clifford Lee WESTON, a 20 year old Grazier from Orange, New South Wales. He enlisted on 16 March 1916 with the 7th Light Horse Regiment, 20th Reinforcements. At the conclusion of the war, he Returned to Australia, 16 May 1919. 1771 Private Colin Joseph WHARTON, a 24 year old Labourer from Gundy, New South Wales. He enlisted on 20 January 1915 with the 12th Light Horse Regiment, 9th Reinforcements. At the conclusion of the war, he Returned to Australia, 15 June 1919. 3557 Private Francis Edward WHARTON, a 19 year old Blacksmith from Wagga, New South Wales. He enlisted on 8 May 1917 with the 7th Light Horse Regiment, 31st Reinforcements. At the conclusion of the war, he Returned to Australia, 28 June 1919. 1581 Private Francis David Roy WHITE, a 17 year old Mail driver from Mullion Creek, New South Wales. He enlisted on 1 September 1915 with the 6th Light Horse Regiment, 12th Reinforcements. At the conclusion of the war, he Returned to Australia, 17 July 1919. 3618 Private Arthur Edward WHYBROW, an 18 year old Clerk from Bondi, New South Wales. He enlisted on 23 April 1917 with the 7th Light Horse Regiment, 32nd Reinforcements. At the conclusion of the war, he Returned to Australia, 15 May 1919. 1729 Private Alexander WHYTE, a 23 year old Canister maker from Croydon, New South Wales. He enlisted on 15 November 1915 with the 12th Light Horse Regiment, 8th Reinforcements. At the conclusion of the war, he Returned to Australia, 28 June 1919. 1792 Private Cecil Henry Hardwal WILKINS, a 20 year old Labourer from Muswellbrook, New South Wales. He enlisted on 5 September 1915 with the 12th Light Horse Regiment, 9th Reinforcements. At the conclusion of the war, he Returned to Australia, 1 April 1919. 2335 Private Victor George WILKINS, a 26 year old Shearer from Longreach, Queensland. He enlisted on 17 July 1915 with the 5th Light Horse Regiment, 16th Reinforcements. At the conclusion of the war, he Returned to Australia, 26 December 1918. 2834 Private Norman WILKINSON, a 19 year old Motordriver from Tumut, New South Wales. He enlisted on 19 January 1916 with the 6th Light Horse Regiment, 19th Reinforcements. At the conclusion of the war, he Returned to Australia, 28 June 1919. 1634 Private Albert Edward WILLIAMS, a 23 year old Blacksmith from Cedar Grove, Queensland. He enlisted on 13 August 1915 with the 5th Light Horse Regiment, 12th Reinforcements. At the conclusion of the war, he Returned to Australia, 15 September 1919. 2090 Private Clifford Rupert WILLIAMS, a 22 year old Wheelwright from Cedar Grove, Queensland. He enlisted on 19 November 1915 with the 5th Light Horse Regiment, 14th Reinforcements. At the conclusion of the war, he Returned to Australia, 28 June 1919. 973 Private Harold Edwin WILLIAMS, a 24 year old Farmer from Kulmura, New South Wales. He enlisted on 16 February 1915 with the 7th Light Horse Regiment, 5th Reinforcements. He subsequently was Killed in Action, 5 November 1917. 2889 Private John Gwydir WILLIAMS, an 18 year old Grazier from Carroll Station via Moree, New South Wales. He enlisted on 15 March 1916 with the 7th Light Horse Regiment, 20th Reinforcements. At the conclusion of the war, he Returned to Australia, 29 April 1919. 2659 Private George Alfred WILSON, a 25 year old Farmer from Wheeny Creek via Kurrajong, New South Wales. He enlisted on 18 January 1916 with the 7th Light Horse Regiment, 18th Reinforcements. At the conclusion of the war, he Returned to Australia, 28 June 1919. 3018 Private Sidney WILSON, an 18 year old Labourer from Wellington, New South Wales. He enlisted on 5 April 1916 with the 6th Light Horse Regiment, 22nd Reinforcements. At the conclusion of the war, he Returned to Australia, 28 June 1919. 651 Private Barder Bardet WOODHAM, a 20 year old Stationhand from Boggabilla, New South Wales. He enlisted on 9 November 1914 with the 7th Light Horse Regiment, 1st Reinforcements. At the conclusion of the war, he Returned to Australia, 10 July 1919. 2405 Private Ernest James WOODS, a 21 year old Labourer from Bexley, New South Wales. He enlisted on 25 October 1915 with the 7th Light Horse Regiment, 16th Reinforcements. At the conclusion of the war, he Returned to Australia, 28 June 1919. 3137 Private John Martin WOODS, a 33 year old Stockman from Cairns, Queensland. He enlisted on 23 October 1916 with the 5th Light Horse Regiment, 24th Reinforcements. At the conclusion of the war, he Returned to Australia, 15 November 1918. 2941 Private Frendenstein Thomas WRAY, a 21 year old Carter from Crows Nest, New South Wales. He enlisted on 16 January 1916 with the 6th Light Horse Regiment, 21st Reinforcements. At the conclusion of the war, he Returned to Australia, 27 June 1919. 2898 Private Ernest Magnus WURTH, a 25 year old Butcher from Bundaberg, Queensland. He enlisted on 3 April 1916 with the 5th Light Horse Regiment, 20th Reinforcements. At the conclusion of the war, he Returned to Australia, 28 June 1919. 2661 Private Arthur YOUNG, a 22 year old Horsetrainer from Rozelle, New South Wales. He enlisted on 27 September 1915 with the 7th Light Horse Regiment, 18th Reinforcements. At the conclusion of the war, he Returned to Australia, 3 November 1918. 2836 Private George YOUNG, a 20 year old Labourer from Charters Towers, Queensland. He enlisted on 10 January 1916 with the 5th Light Horse Regiment, 19th Reinforcements. At the conclusion of the war, he Returned to Australia, 28 June 1919. 189 Private Essington Lowther ZOUCH, a 24 year old Farmer from Nimbin via Lismore, New South Wales. He enlisted on 21 October 1914 with the 7th Light Horse Regiment, A Squadron. He subsequently Died of Wounds, 17 November 1917. The Roll of Honour contains the names of all the men known to have served at one time with the 2nd Australian Light Horse Machine Gun Squadron and gave their lives in service of Australia, whether as part of the 2nd Australian Light Horse Machine Gun Squadron or another unit. Leslie John ABBERTON, Killed in Action, 30 November 1917. Stanley BRENNAN, Died of Illness, 14 February 1919. Douglas CURRAN, Died of Wounds, 20 April 1918. James Judge DAVIES, Died of Illness, 22 October 1918. Eric Fane DE SALIS, Killed in Action, 5 November 1917. Frank William FREESTONE, Killed in Action, 10 November 1917. Roy GEORGE, Died of Wounds, 8 November 1917. Clifton Henry James HOAD, Killed in Action, 5 November 1917. Henry Albert HOLDGATE, Killed in Action, 10 November 1917. William James Hamilton LOWE, Killed in Action, 28 August 1918. Ernest John NORTON, Killed in Action, 19 April 1917. Harold Reath OLVER, Killed in Action, 4 August 1916. Cornelius James RYAN, Died of Wounds, 4 May 1918. Lionel Francis Watson SMITH, Killed in Action, 5 August 1916. 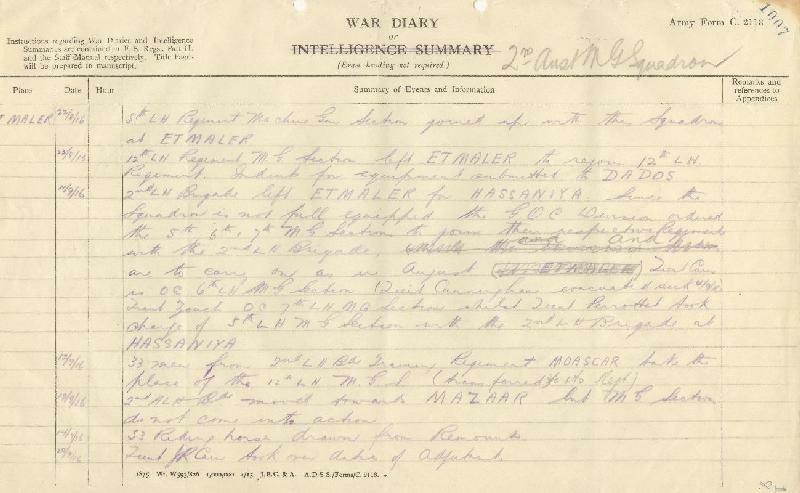 War Diary account of the 2nd LHMGS, AIF. Turks move from Oghratina and occupy Qatia. The 2nd Light Horse Brigade with our 6th and 7th Machine Gun Sections occupy the ridge 1½ miles west of Qatia. 3 (three) Machine Guns being without transport, are manned by scratch crews from men in camp and placed on the Outpost Line, with the Royal Scottish Fusiliers, South and West of Et Maler. The 12th Regiment Machine Gun Squadron being newly mounted and untrained in any mounted work are placed in a position of readiness two miles north west of Et Maler with Lieutenant Dixon in charge. Remainder of Squadron in Camp are in charge of Lieutenant Nivison. 2nd Light Horse Brigade (less 5th Light Horse Regiment) returned to Et Maler about 2100 being relieved by 1st Light Horse Brigade. Orders to "Stand to" received at 0200. 6th and 7th machine Gun Sections move out with 2nd Light Horse Brigade at 0330 taking up defensive position on Wellington Ridge which became the firing line about 0530 when 1st Light Horse Brigade withdrew. Our horses are bombed by aeroplanes. The shrapnel and machine gun fire is heavy but few casualties in men and horses experienced. At 0700 Wellington Ridge enfiladed and the ridge west of Et Maler extending in a north westerly direction occupied. Lieutenant Zouch placed his Machine Gun Section on left of 7th Light Horse Regiment where Lieutenant Dixon joined him with the 12th Light Horse Machine Gun Squadron. Lieutenant Cunningham took his Machine Gun Section to the right flank with the 6th Light Horse Regiment and advanced with them at 1700 where the New Zealand Mounted Rifles Brigade took Mount Royston. The Lewis Guns of the 6th and 7th Light Horse Regiments having no crews are detailed as follows: 2 to Lieutenant Nivison who aided by Trooper Wearne (a member of the No. 2 gun in the Outpost Line) together with an untrained crew - from members of this Squadron - took the Lewis Guns into action on the right of the 7th Light Horse Regiment. One Lewis Gun is given to "C" Squadron, 7th Light Horse Regiment and the fourth to the Scottish Fusiliers supporting the ridge two miles north west of Et Maler. The Machine Gun Sections advance dismounted with the attack at 0430, Lieutenant Zouch with his Machine gun Section accompanied the 7th Light Horse Regiment mounted, wheeling south, then east then driving to Turks to Qatia. The 6th Light Horse Regiment and Wellington Mounted Rifles Regiment joined them. 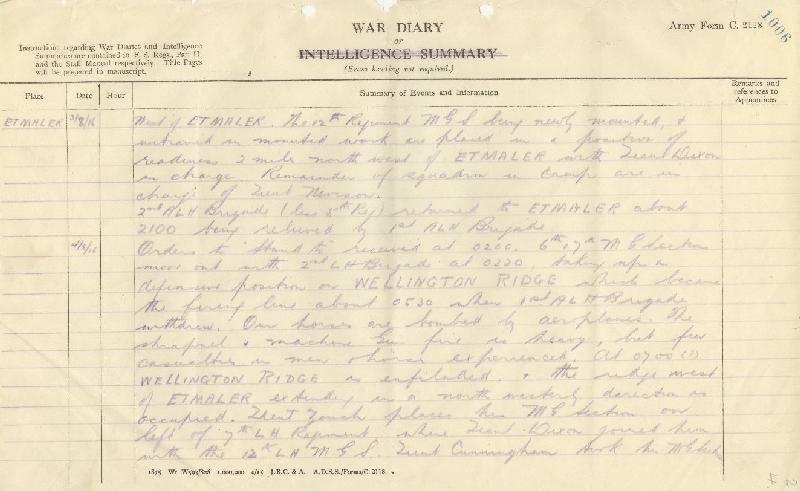 At 1330 Lieutenant Zouch and Dixon with their Machine Gun Sections advanced with the Wellington Mounted Rifles Regiment. Lieutenant Cunningham being with the 6th Light Horse Regiment until within about 1000 yards from the enemy's position and were held up until 1900 when the retirement was ordered, the 2nd Light Horse Brigade reaching Et Maler 2130. Casualties to date:- Killed 2; Wounded 6. 2nd Australian Light Horse Brigade moved toward Mazar but the Machine Gun Section did not come into action.